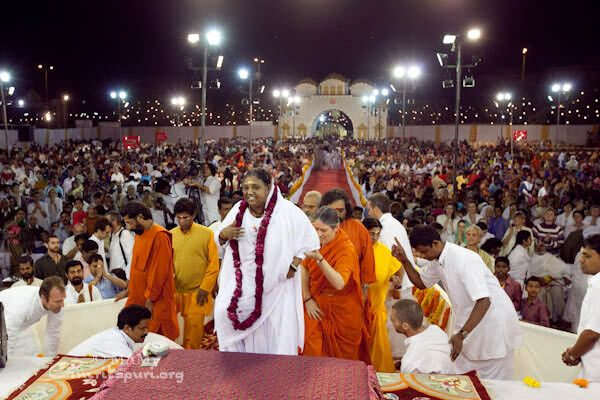 Amma and the tour group reached the Kolkata Brahmasthanam temple after a few hours drive from Durgapur. 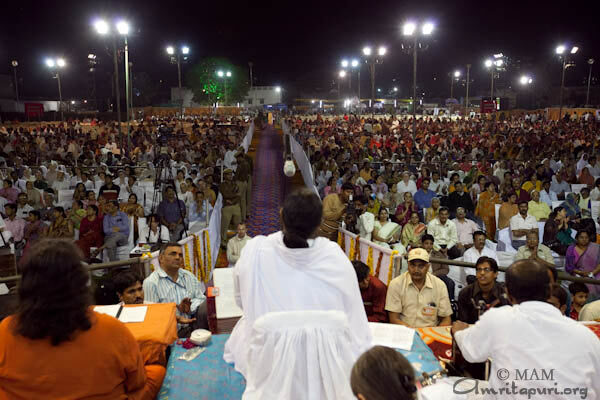 Immediately after the buses reached, Amma had called the whole tour group to the roof of the Kolkata Ashram building. 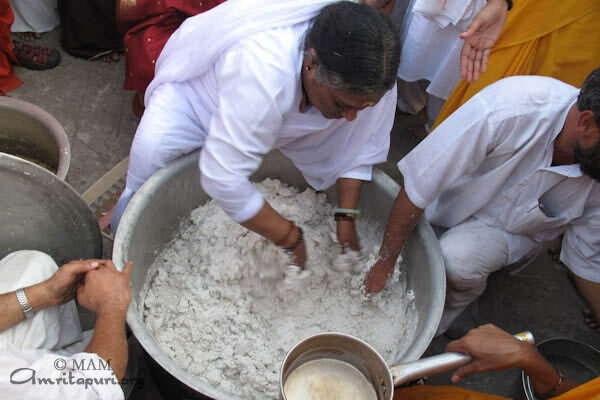 Amma had set up huge pots to make rice batter and had started to roll rice flour for making kozhukkatta 1. 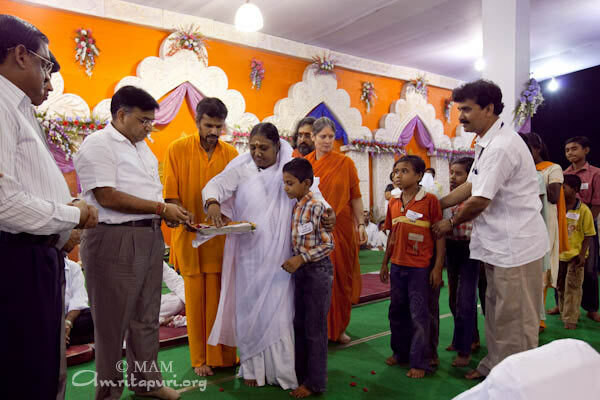 Amma had expressed that she personally wanted to spend more time with her children, make food for them and see their smiles. 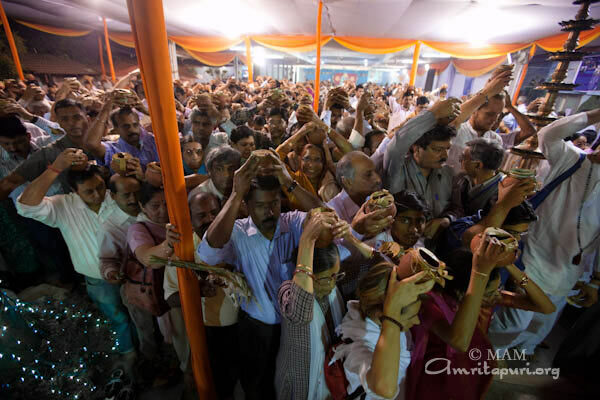 Soon the whole lot of around 500 people crowded around Amma. 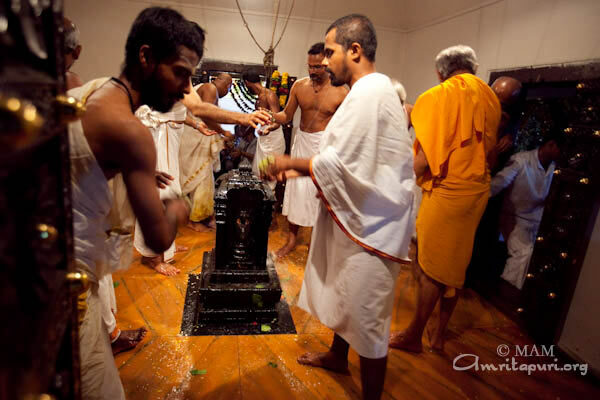 To catch glimpses of Amma, some crowded a shaky metal staircase that led to the top roof, many perched on the roof at various corners looking at Amma below, few others even hung on precariously to the supports built for clothes-strings that are used to hang wet clothes. 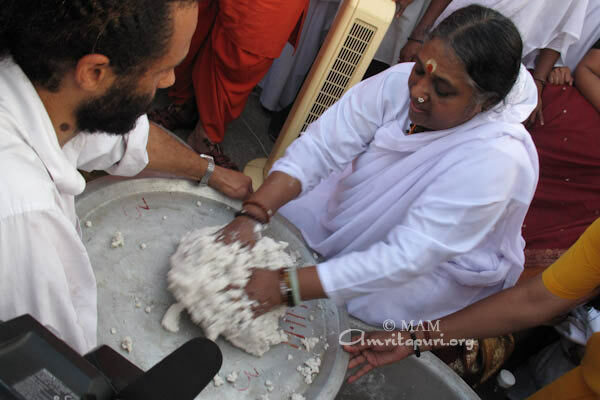 Amma used one large pot to put some flour and started kneading it with some water. She took some salt in her hands and after mixing it with water sprayed the water on the dough and then kneaded. 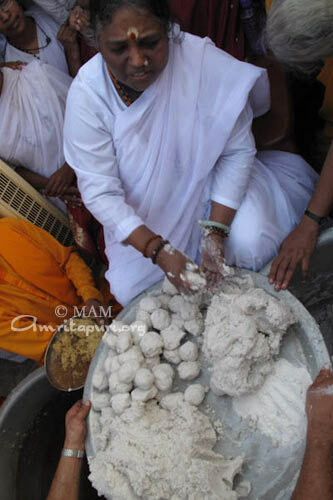 Amma seemed very agile as she made the small balls of dough and almost all the balls were of similar dimensions. 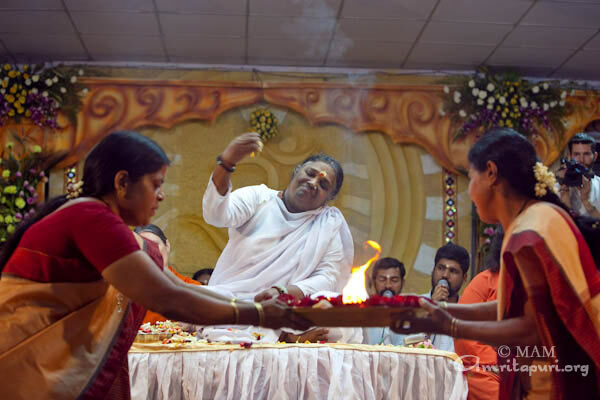 Amma took some jaggery added coconut scrapings and handing out a plate of the same indicated that others could help her filling the inside of the kozhukkatta with the sweet jaggery. 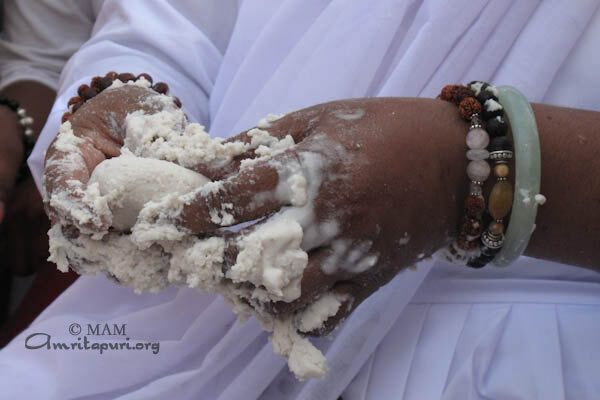 To everyone who came forward to do the filling, Amma would ask “Did you wash your hands well?” Amma had made the balls and others were asked to fill in the jaggery inside. 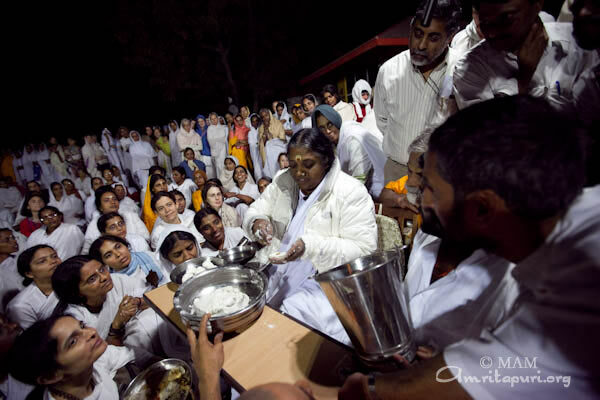 Many hands kept filling the jaggery into the kozhukkatta as Amma would roll out the rice balls. kozhukkatta were made in batches. 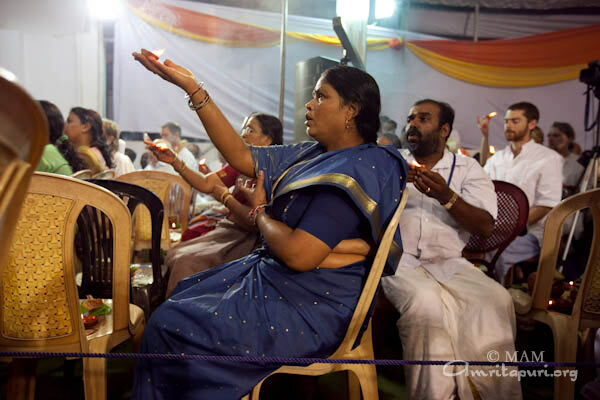 As each batch of kozhukkatta was being passed from Amma’s side, applauds were heard indicating the celebration. 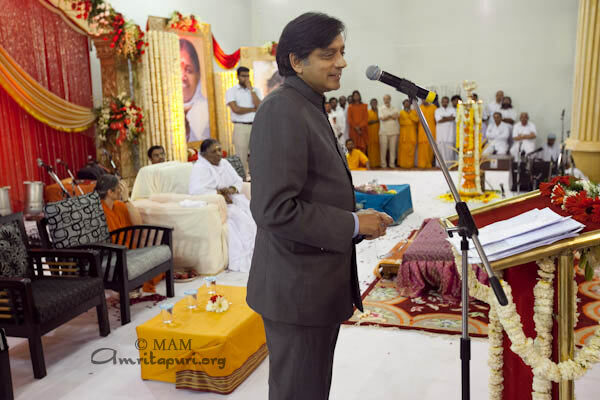 Although Amma spoke in jokes and there was laughter as the making process was on, Amma’s actions seemed a beautiful reminder of how one should effectively do action. 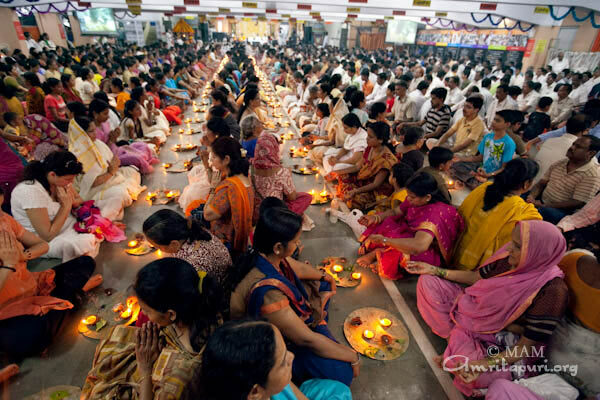 Amma started counting the kozhukkattas made. 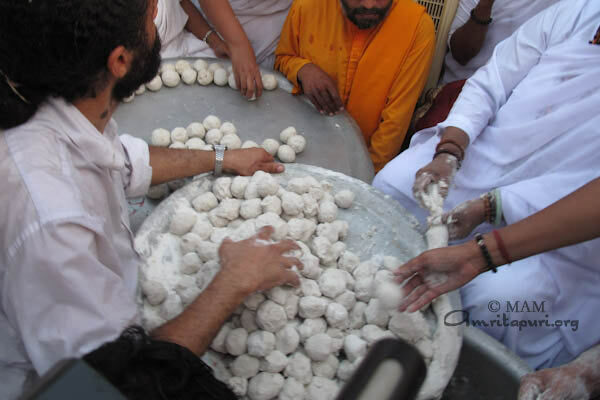 Around 800 kozhukkattas were made in four batches. 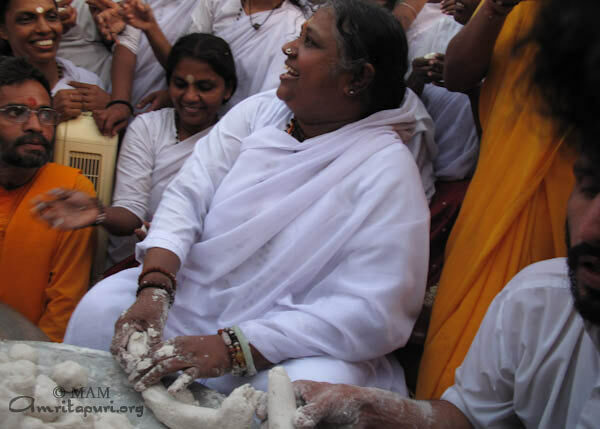 After counting that there would be sufficient, Amma started cleaning the dough pot. She started scrapping the little pieces that stuck on the plate, rolling them with her hands and then added water twice to remove small pieces stuck on the plate. 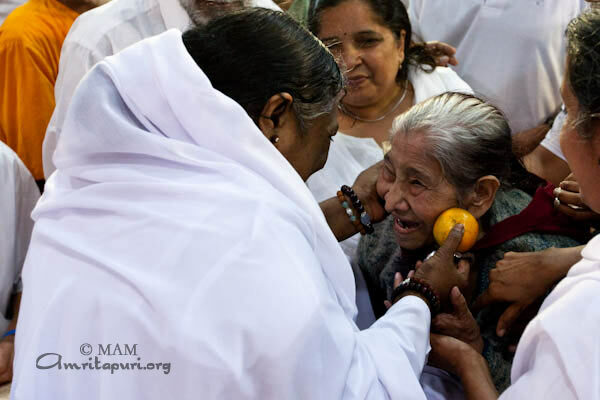 Amma mentioned that while she was young, her mother Damayantiyamma, would tell her “It is not we who created the food, then what right do we have to waste it?” if even a single grain of rice would fall out during rice de-husking . 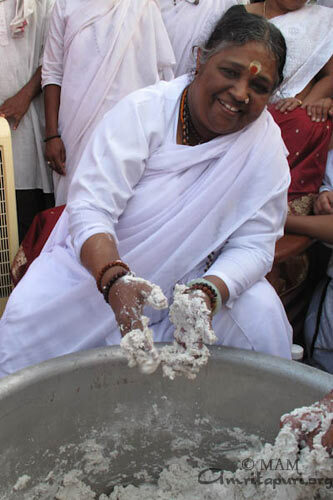 Mentioning this, Amma cleaned remaining flour that was sticking to the utensil and rolled the last kozhukkatta ball. 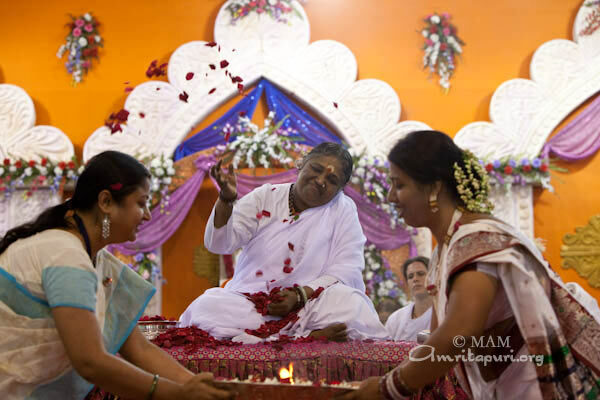 Soon after, Amma cleaned her hands and started singing Bhajans to thrill everyone around. 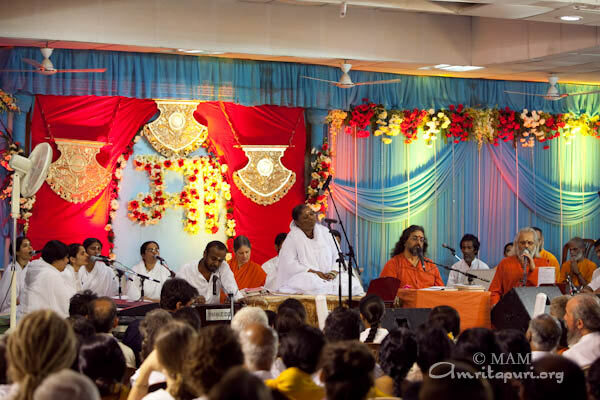 Swamis took a seat next to her, followed by musicians who squeezed in since no one wanted to move away from Amma. 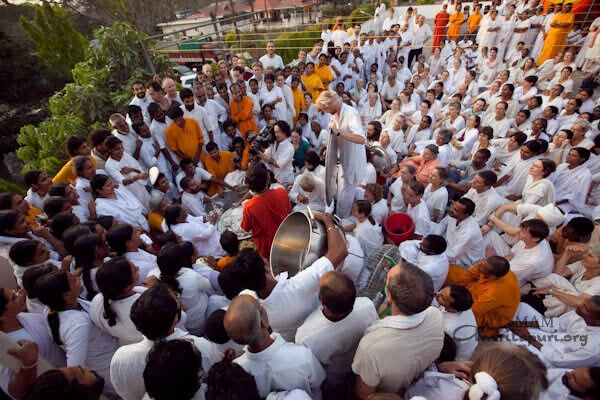 Local devotees too joined the celebration. 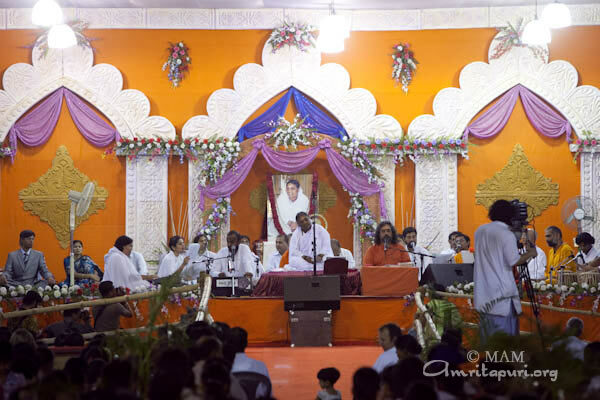 Amma sang a few Bengali bhajans, one Malayalam bhajan and a fast Marathi ‘Ayi Bhavani’. 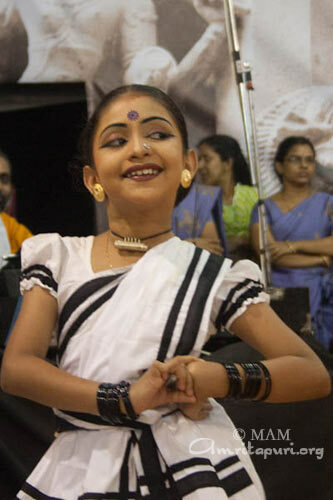 As the tempo of ‘Ayi Bhavani’ increased, Amma started salutations “Mata Rani ki” and the whole crowd replied with a “Jai” and this went on for some time and then came many “Maha Kali ki”. 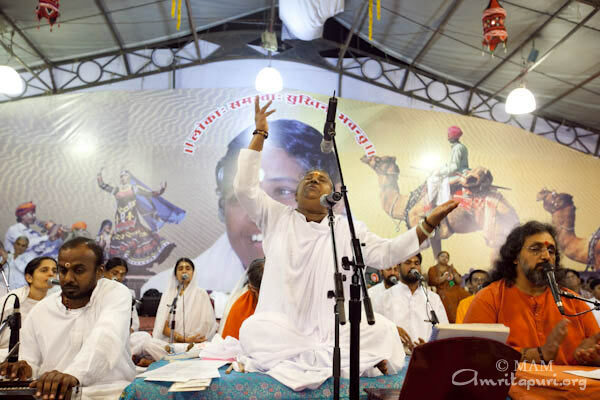 As the song was getting on higher and higher, Amma started ululation that was followed by many who followed her doing the same. 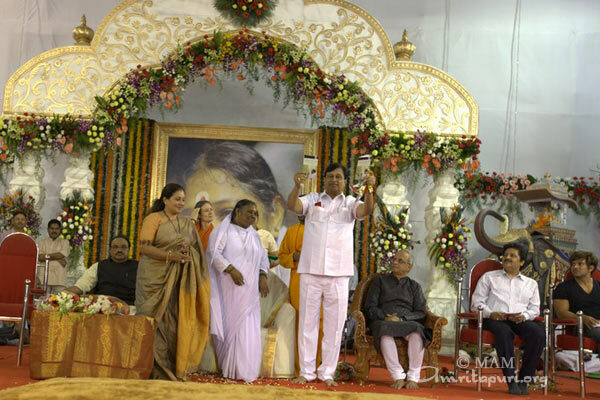 Amma chanted “Kali Kali Kali” to the joy of the whole crowd. 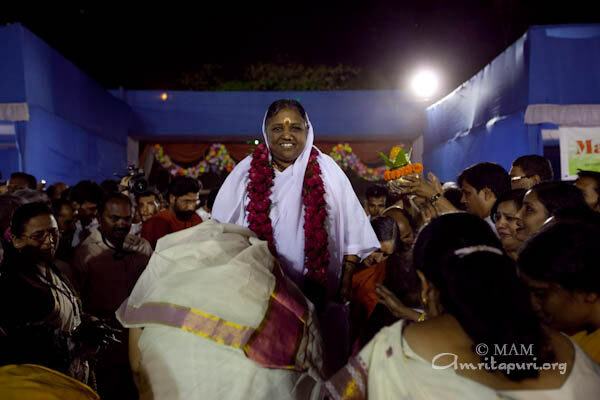 In this Kali-Ghat2, Amma wanted to sweeten the lifes of many children who had come to her in their own ways seeking peace and refuge. 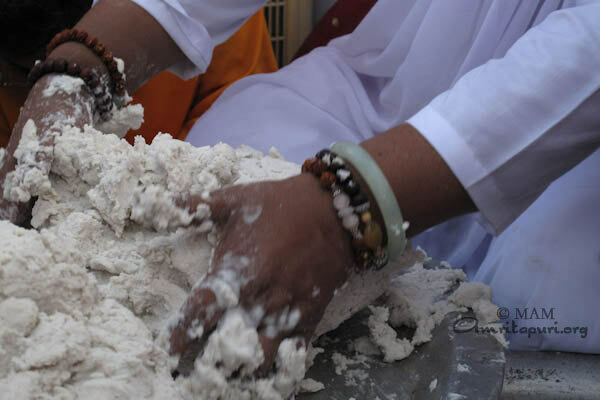 With Master’s Grace working on the dough representing our life, spirituality as the core jaggery, even our life becomes a joyful experience. Isn’t that what she wants to see? 1 kozhukkatta (also known as modakam) is a delicious sweet-dish made of rice flour with sweetened coconut-jaggery filling. It is known to be Lord Ganesha’s favourite food item. 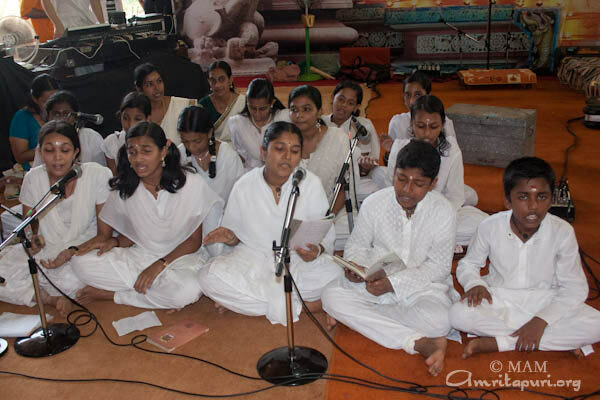 Amma’s program in Durgapur was after few many years since the last program in 2004. 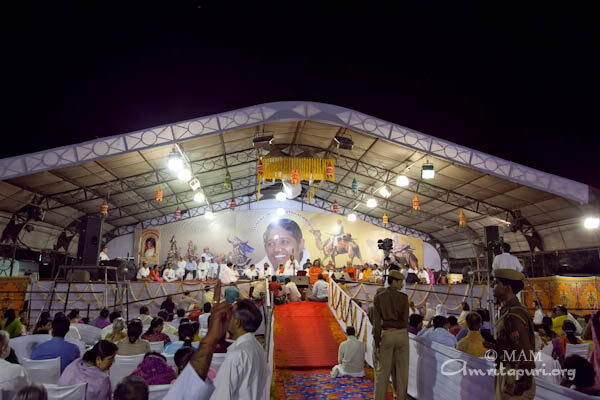 The whole city seemed colored with posters announcing Amma’s arrival. Durgapur is one of the industrial cities of Indian state of West Bengal known for its steel industries. 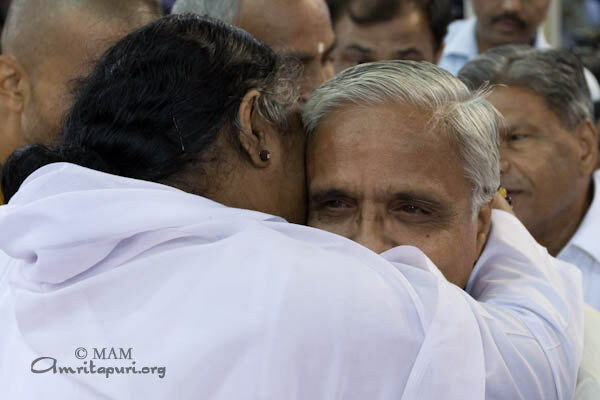 Amma had driven for more than 2 days from Delhi before reaching Durgapur. 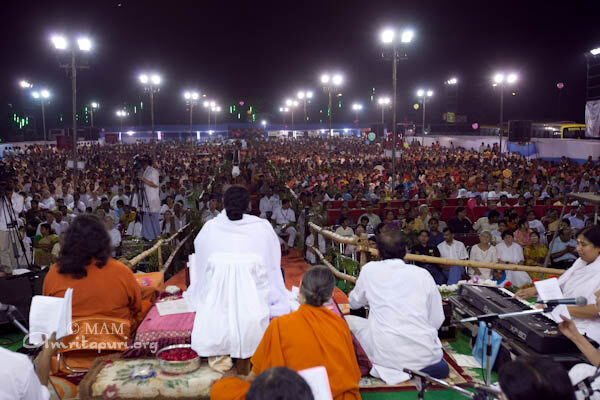 Amma was welcomed on the stage by ululation by devotees wearing tradition Bengali clothes. 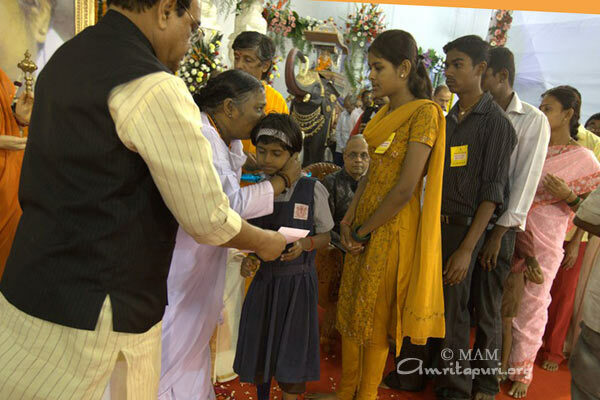 The public program started with the distribution of 50 Vidyamritam scholarships to poor students. 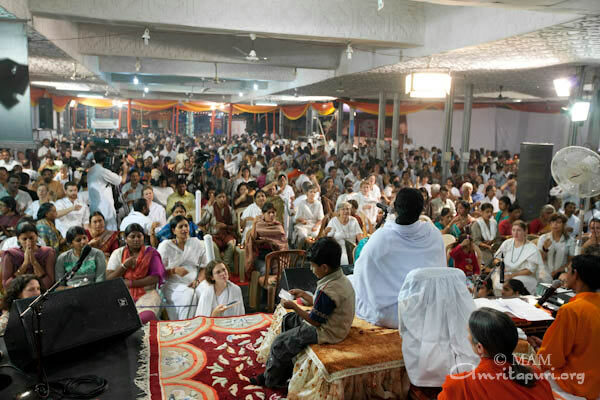 Amma’s satsang was translated into Bengali, the local language. 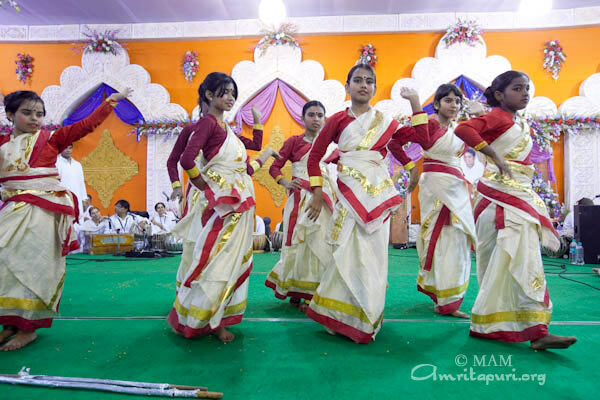 Some steps of the Manasapuja Amma did in Bengali. 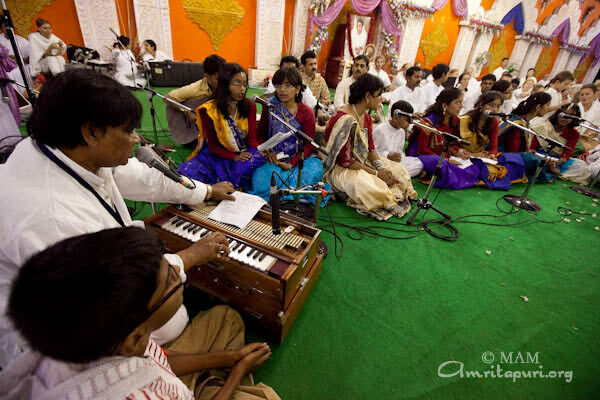 Many bhajans were sung in Bengali too. 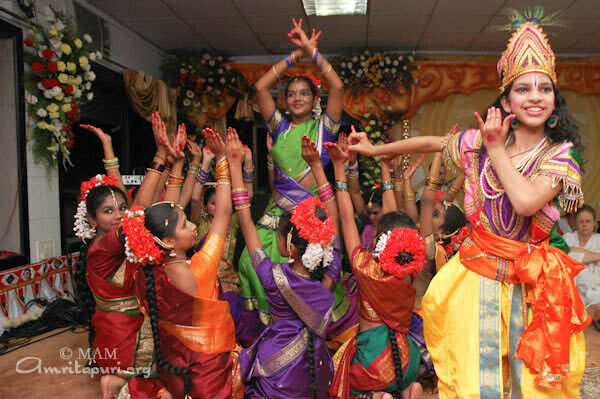 Amrita Vidyalayam students performed several cultural programs including dances, yoga shows and musical performances. 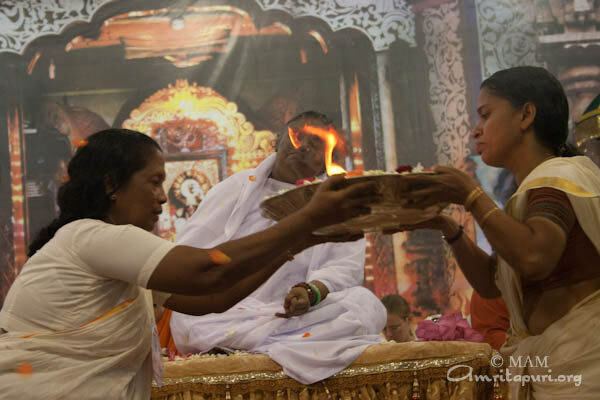 The Darshan went on until 4 am in the morning. 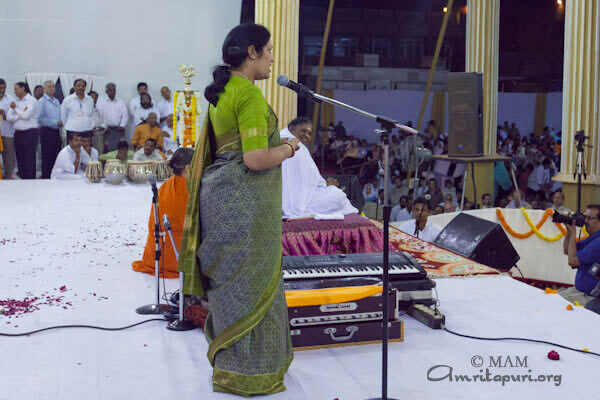 Just before Amma got up from her seat, she sang some bhajans leaving the excited crowds almost dancing on their feet. 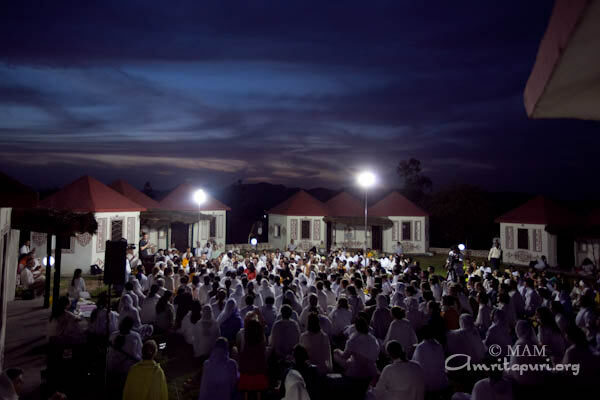 The second half of Amma’s Delhi programs were held at the beautiful Ashram venue in Vasant Kunj. 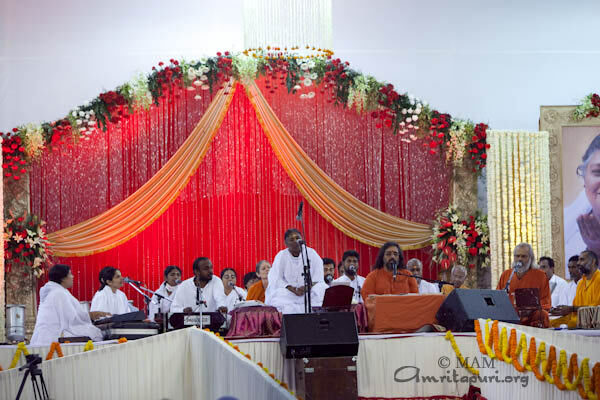 With the Bramasthanam Temple at the venue and the beautiful natural surroundings close by, the atmosphere itself seemed spiritually vibrant. 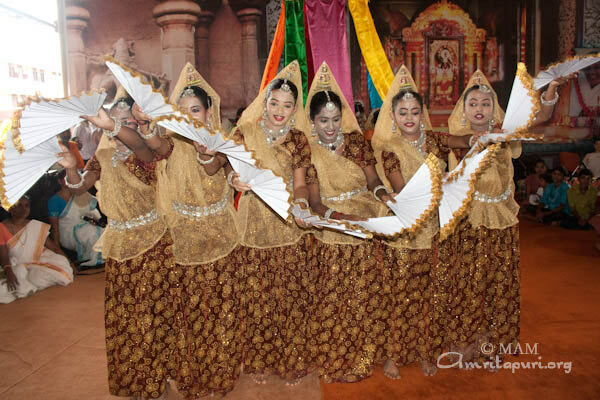 The majestic birds of Lord Subrahmanian, peacocks, seemed to welcome all the guests and devotees by their unusual cry. 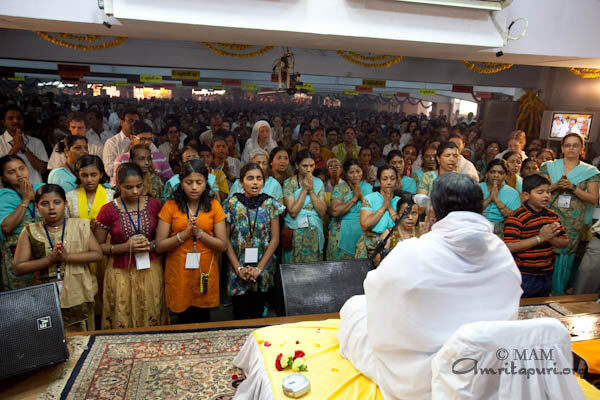 Since the very first day of the program, the local youth, as part of AYUDH-Delhi, were very active, setting up stalls selling delicacies to help raise funds for Amma’s charitable projects. At night, the temperature would drop down to below 16 degrees, and many people could be seen wrapped up in shawls and sweaters and woolen caps. 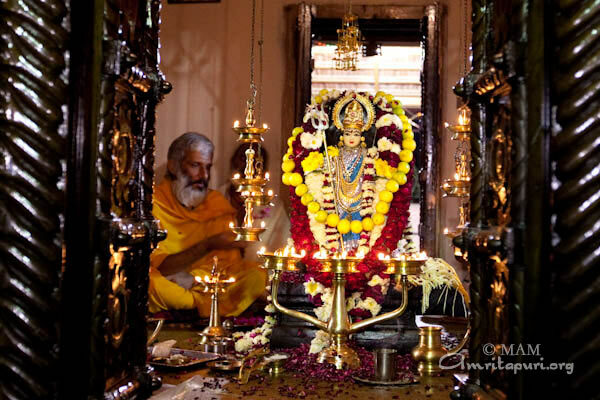 The Bramasthanam temple was decorated with strings of yellow marigold and bouquets of white flowers. 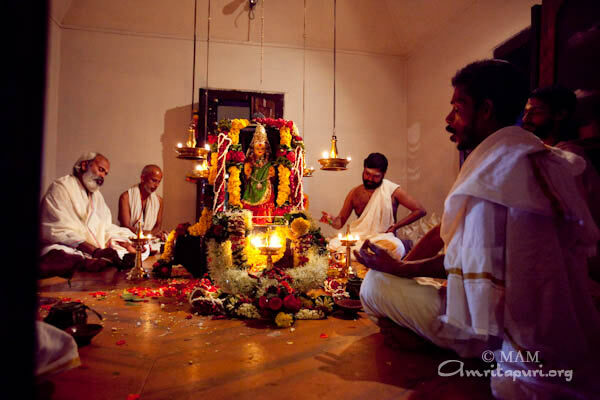 Homa and puja were conducted all around the auspicious timings and arati bells would chime in harmony. 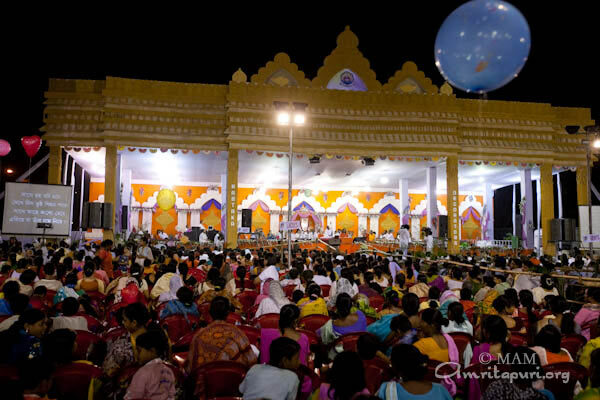 Amma’s two-day program consisted of both morning and evening programs of bhajans, Satsang, guided meditation. 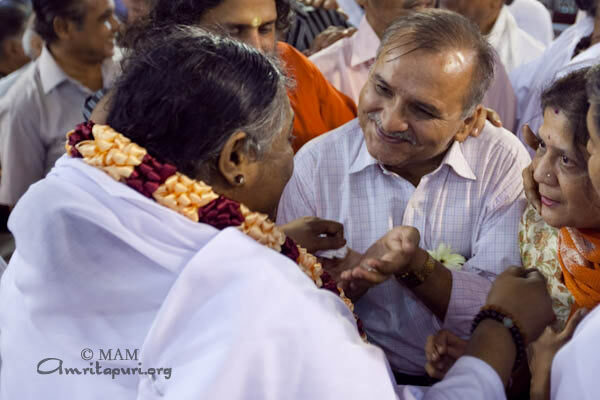 Of course, Amma also gave darshan to everyone who had came. 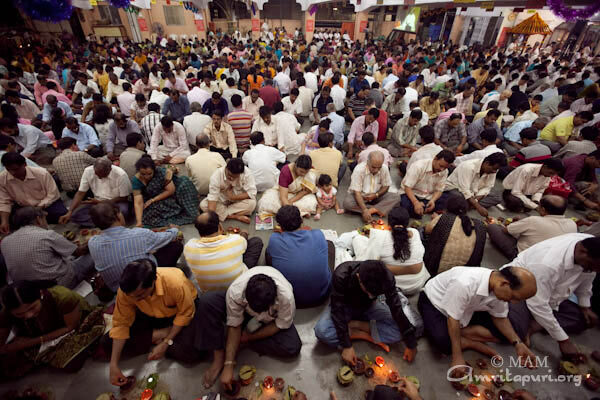 Many people participated in the special pujas conducted during the occasion. 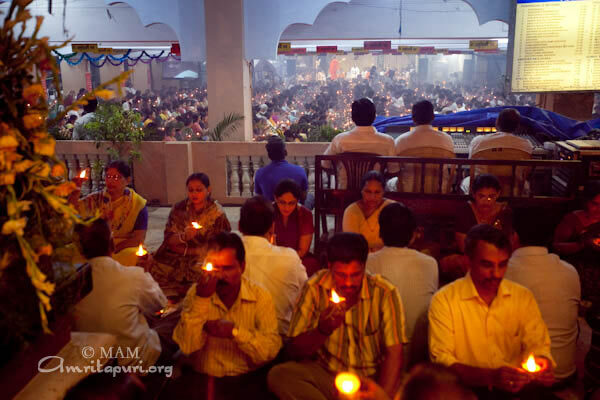 There were lines queuing even as the puja started and had to be accommodated at every corner of the Bramasthanam. 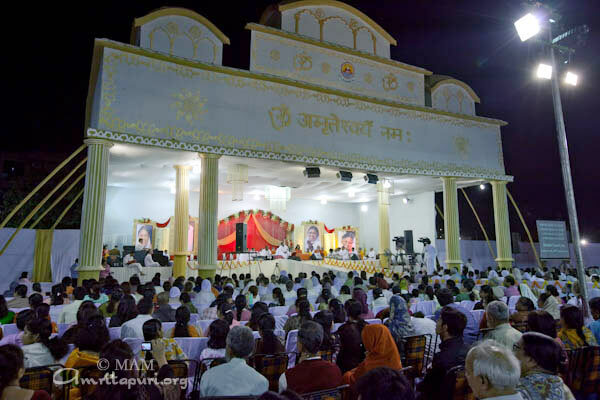 Many dignitaries visited Amma during these two days, including the Chief Minister of Maharashtra, various government officials. 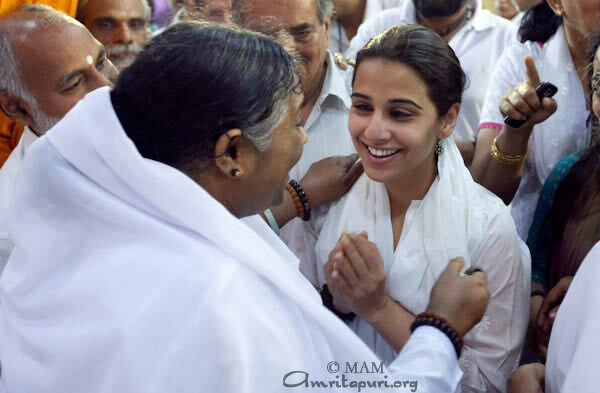 Vidya Balan, a film celebrity, also visited Amma during the program. 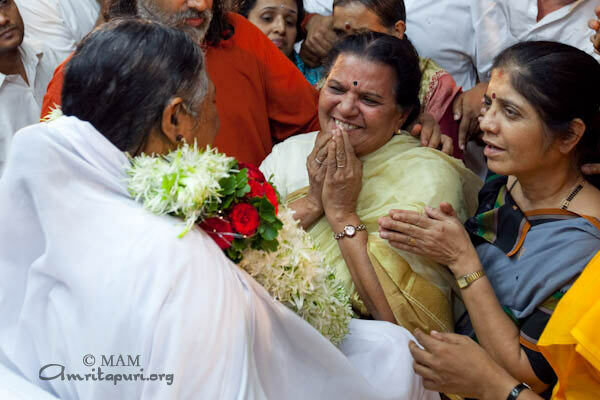 After darshan was finished, Amma renewed the festive mood by singing three bhajans, concluding with an exciting version of the Punjabi bhajan “Mata Rani.” As Amma’s hands went up, smiles grew bigger. 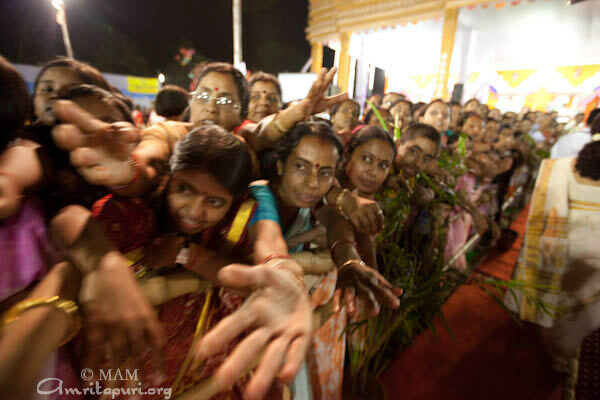 And when Amma shouted “Mata Rani ki!” the crowd unanimously cheered in response “Jai.” When Amma walked back to her room at 5:30 a.m., many devotees who had tears in their eyes—a mixture of joy, of gratefulness and the pain of already missing Amma more than they had imagined possible. 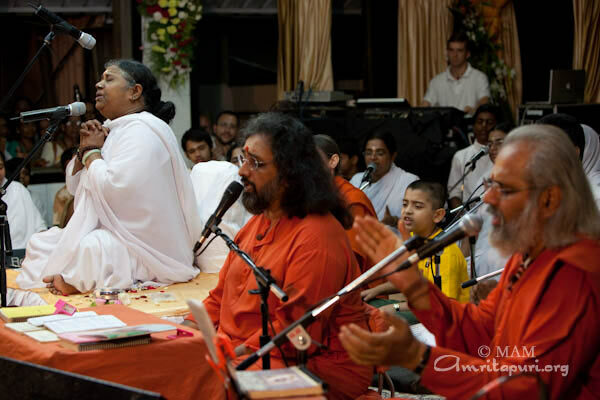 With Amma, celebration of colors is a daily event and every day is a holi. It is up to us to make the best of this daily celebration. That was exactly what happened at Jaipur. 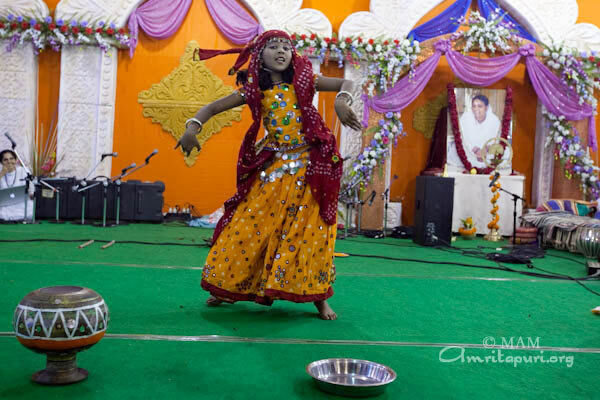 The house where Amma stayed became a place for Holi celebration. 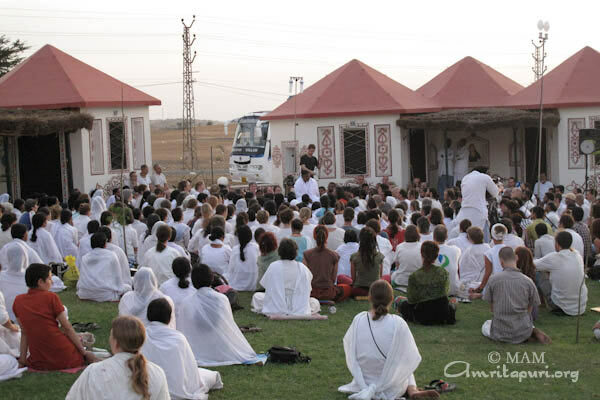 When Amma was starting out to Delhi from Jaipur, around 70 members of the family gathered around her. 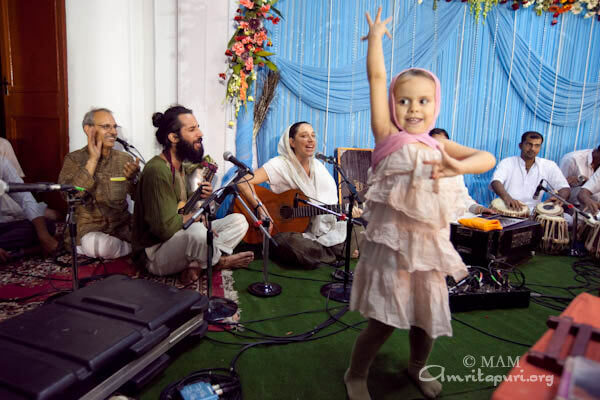 They requested to sing and play holi with her. 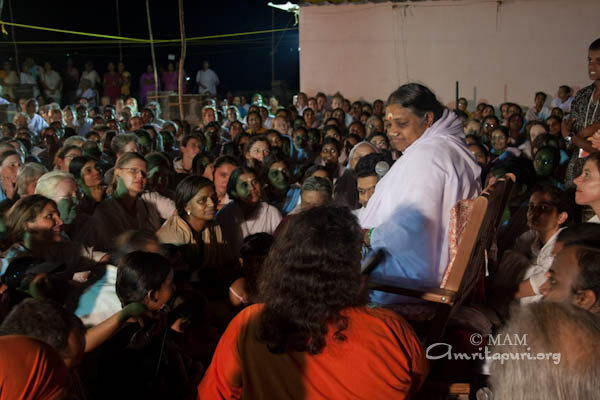 Amma was asked to sit on a chair. 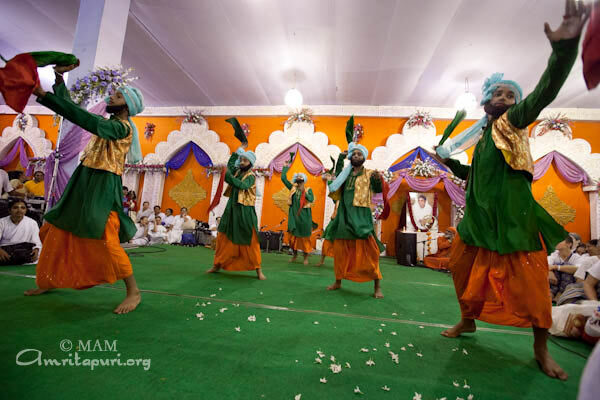 There was singing already in the air, energized with the accompaniment of dolaks and manjeera (kaimani). 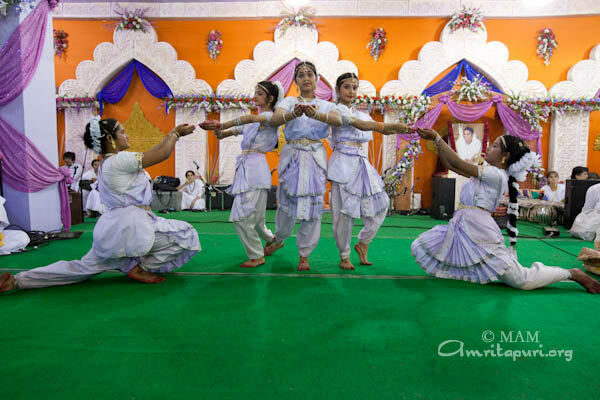 With the full spirit of celebration, the girls around Amma started dancing to the tunes of ‘radhe radhe radhe’. 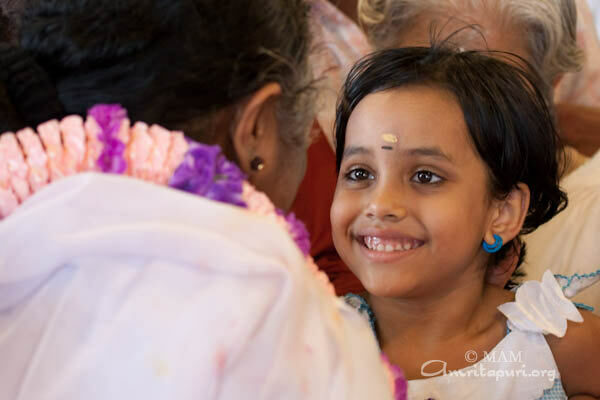 The mother of the house, a very elderly lady, joined the festivities to the thrill of everyone around by coming to the forefront, dancing in front of Amma and then holding Amma’s hands as she danced to the tune. 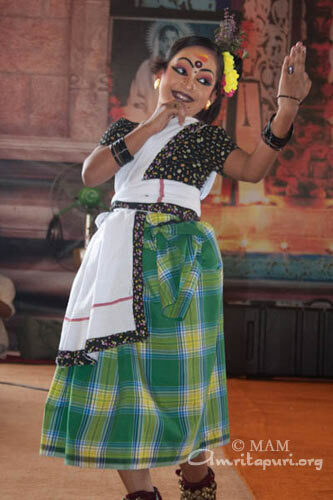 As the girls danced and swirled around, Amma asked for manjeera and started playing it, leading the festivities. 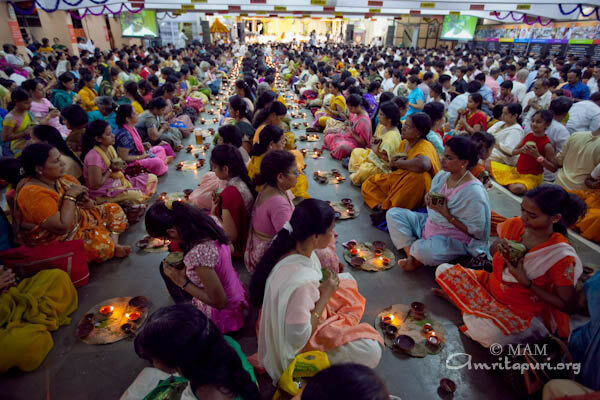 As the tempo increased, devotees started showering colorful flowers on Amma, coloring the area yellow, rose, dark yellow. 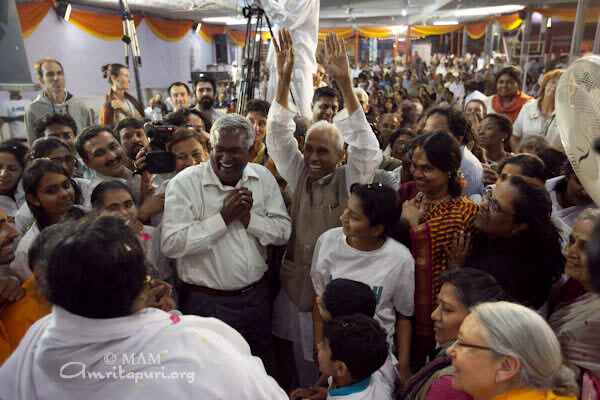 Amma was enjoying every minute of it as the cheer grew louder. 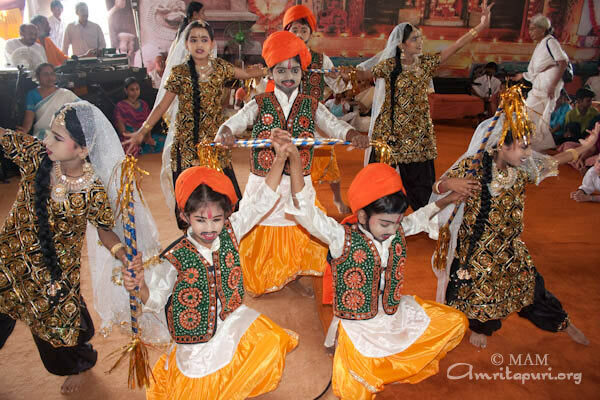 The cheer became shouts of “holi, holi, holi”. 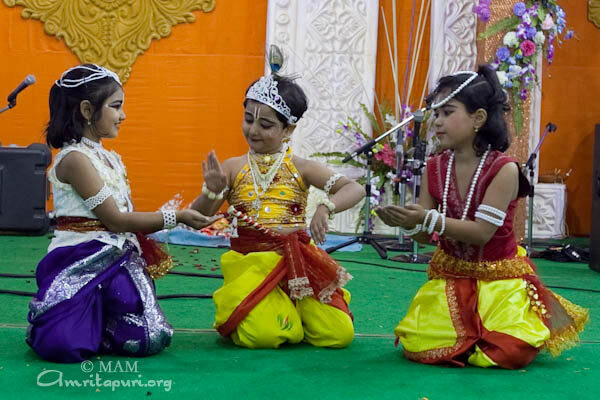 The owner of the house and his daughter started dancing, holding Amma’s hands, reminding us all of the beautiful play between Lord Krishna and the gopis. 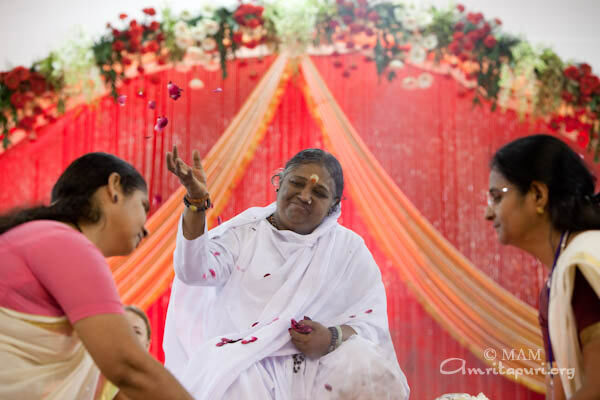 As the event calmed down, more flowers showered on Amma and added colorful beauty. 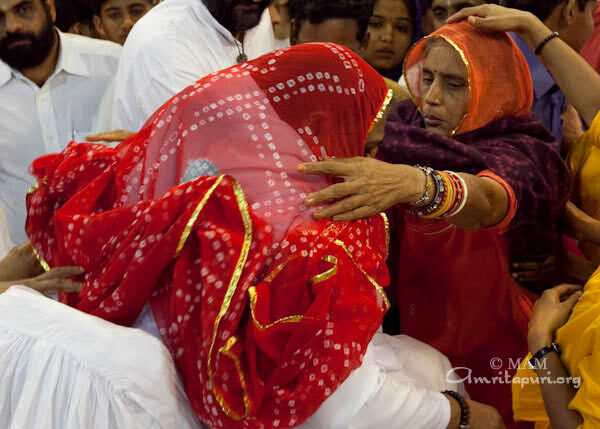 This very family had celebrated Holi with Amma some years ago. 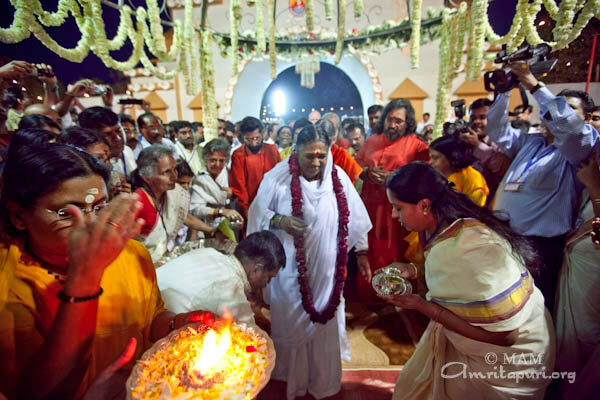 But this year, the day with Amma became their Holi. 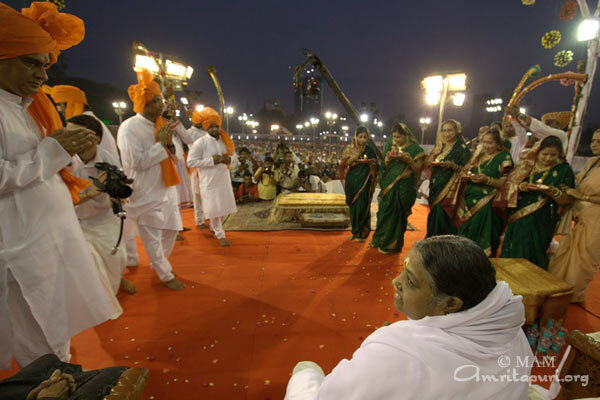 This incident happened during Amma’s visit to Mumbai this year on the Bharata Yatra 2010. 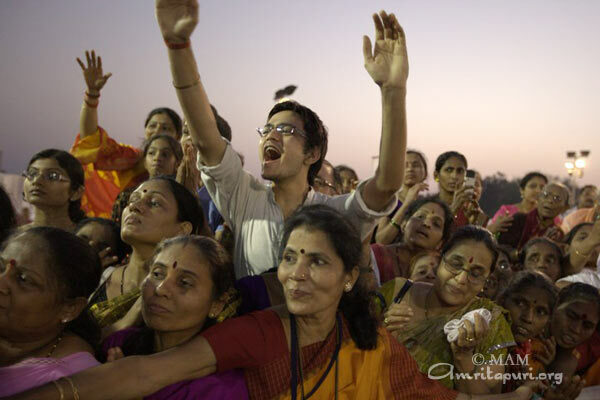 It was the first day in Mumbai, Amma was on her way to the public program in Sivaji Park. 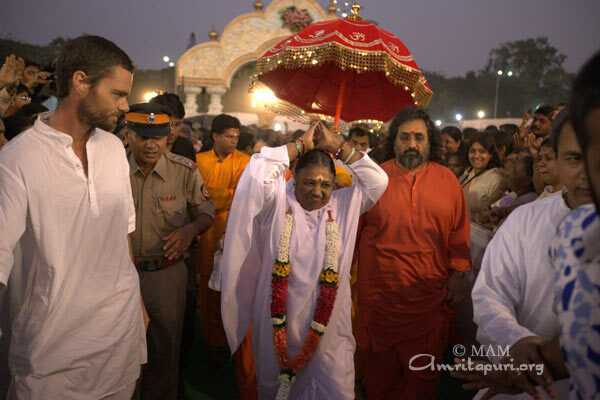 There were few vehicles following Amma’s car. Very close to the venue, vehicles got held up in a traffic jam. Amma stepped out of the car and got in to the camper which was right next to the car. Just then, a middle aged lady standing on the pavement of the road holding the hand of a twelve year old girl, came rushing towards the camper. 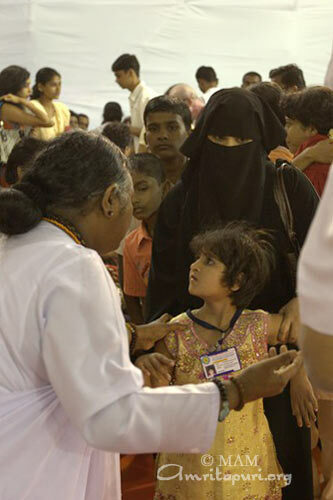 A devotee escorting Amma’s vehicles stepped out and requested the lady to move back to the pavement. The lady walked back very dejected. The traffic jam cleared momentarily and the vehicles moved ahead of the junction on to the opposite lane for another stop. 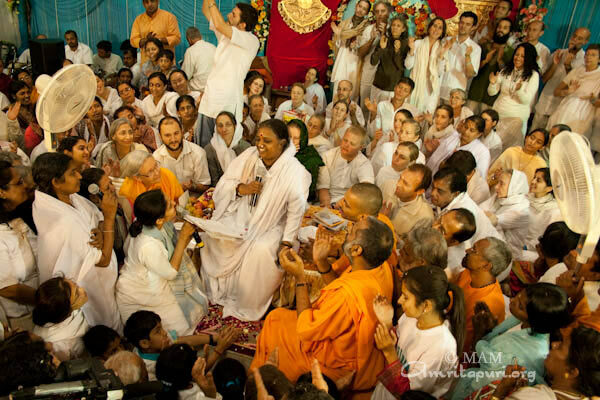 Now, Amma stepped out of the camper and again got in to the car, got caught in very slow moving traffic. This lady now walked across the junction and tried to approach Amma’s car from behind. 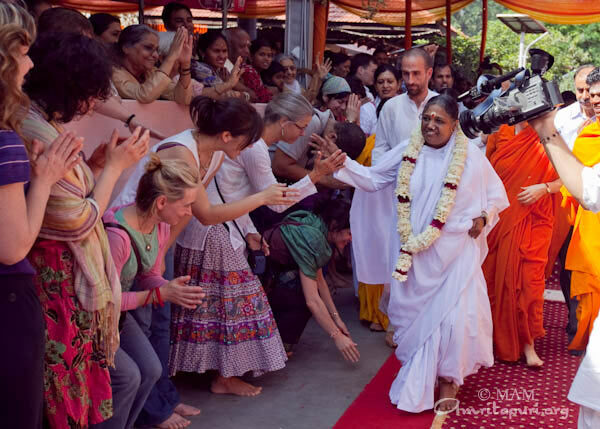 The same devotee again rushed out to stop her before she got to the car. 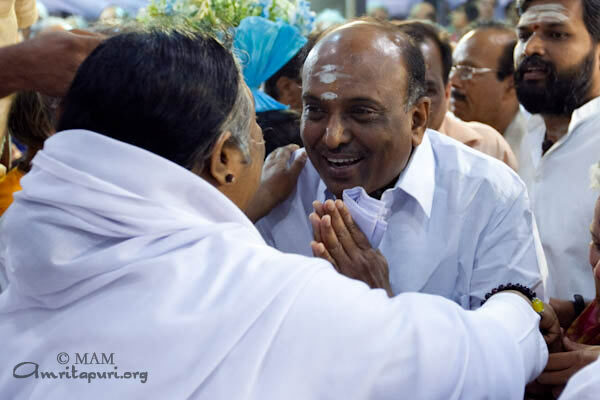 He stopped her out of sight of Amma and tried to console her saying she could get darshan in a few hours if she came to the program venue. 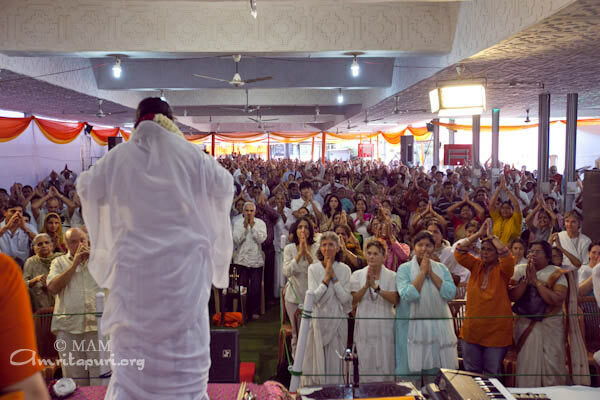 Suddenly, Amma lowered the window glass of the car and motioned to the devotee. He ran to the window and then turned around and called the lady saying Amma is asking for her. 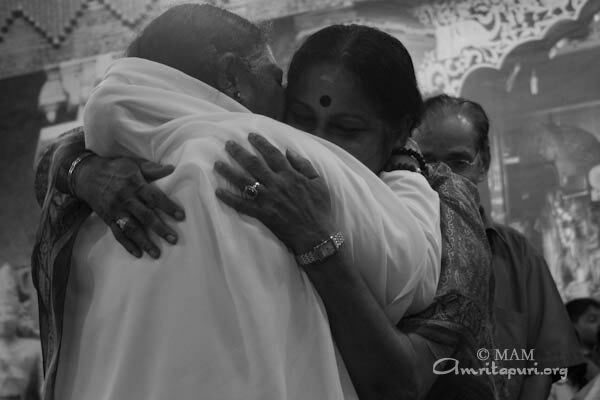 Amma stopped the car, gave the lady and her daughter a long hug, kisses and prasad through the car window. The lady came back, tears streaming down her cheeks. 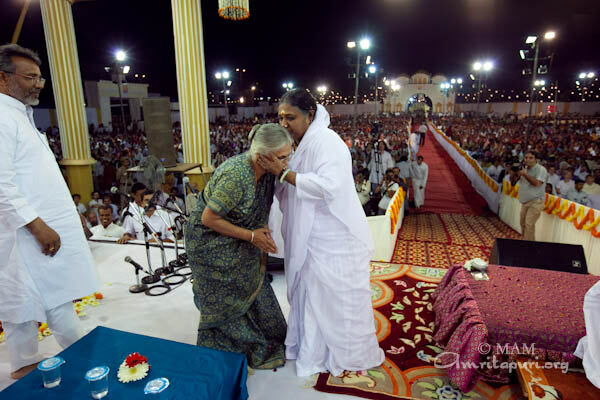 She thanked the devotee and said, “I have never met Amma before. 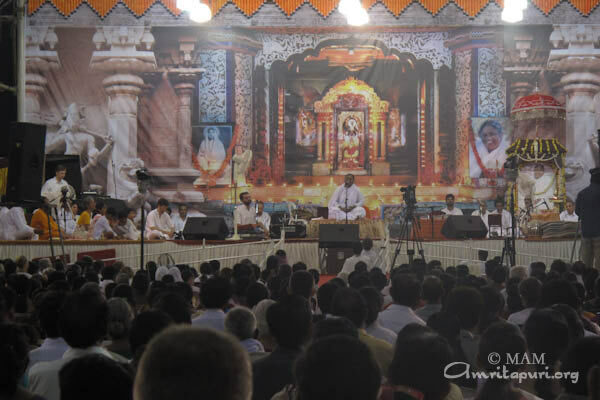 It was just today that I happened to see a road-side banner announcing Amma’s visit to Mumbai and I realized she is a spiritual master. 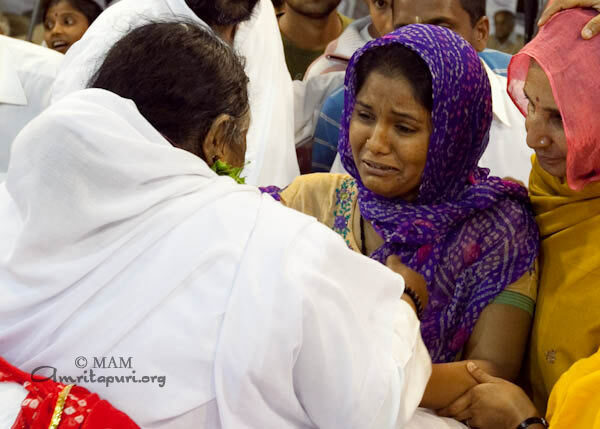 When I saw Amma step out of the car, I recognized her as the same person I saw in the picture on the banner. The truth is that I just stepped out for a walk out of the hospital, where my husband is lying in bed in comatose, and my young son is admitted in the intensive care unit awaiting a kidney transplant. I was in deep distress. I didn’t know what to do. 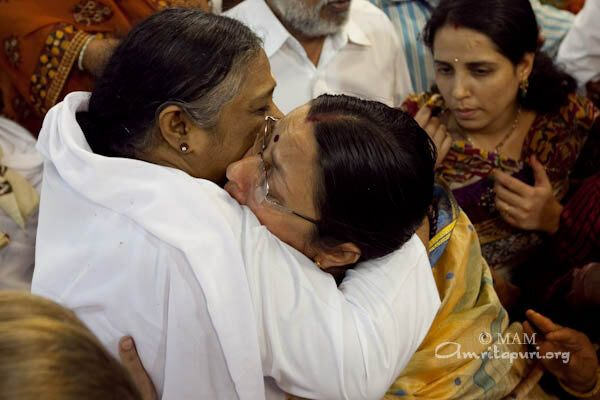 When I saw Amma step out of that car, I just broke down weeping, I know not why”. But Mother knows … right? 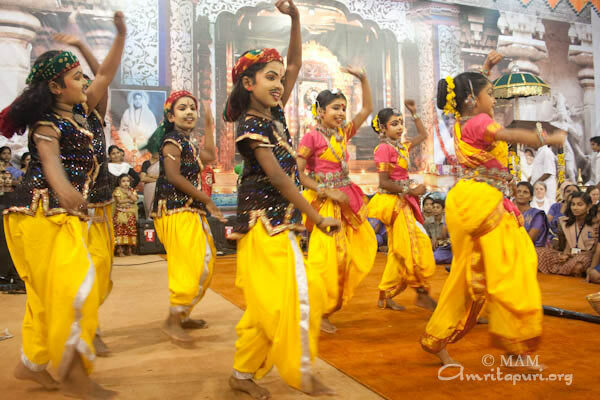 Amma started her programs in Delhi in one of the capitol’s new suburbs on the west bank of the holy Yamuna River, not far from where Lord Krishna used to dance with the Gopis. 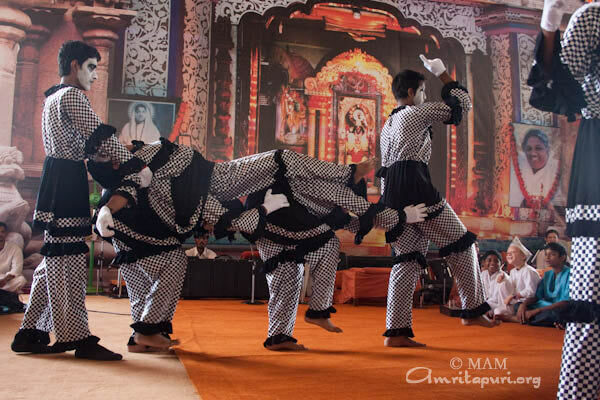 The entry to the venue was a temporary Rajasthani monument. The stage had six massive pillars. 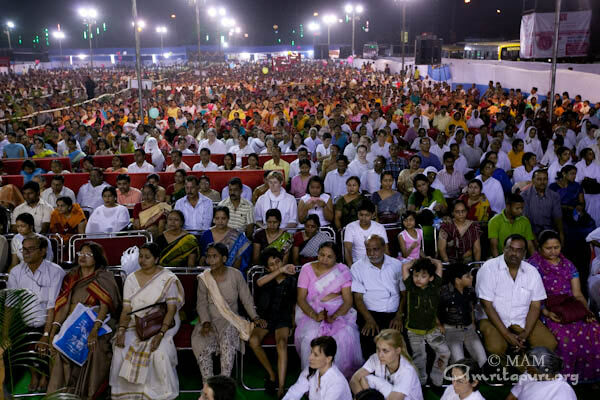 The crowd did everything possible to catch a glimpse of Amma as she walked to the stage. She sat in front of an arch decorated with flowers with thousands of crystals giving off a red hue. 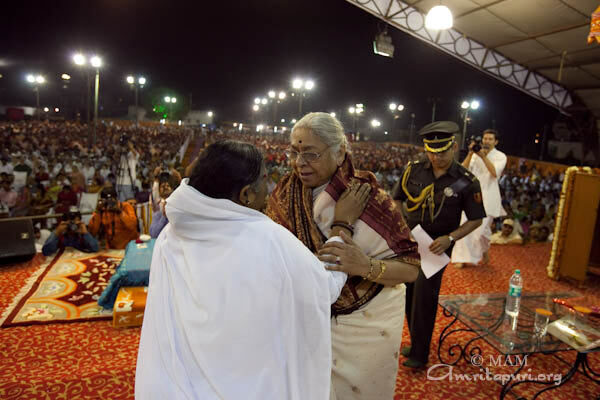 Amma was welcomed by the Chief Minister of Delhi, Smt. 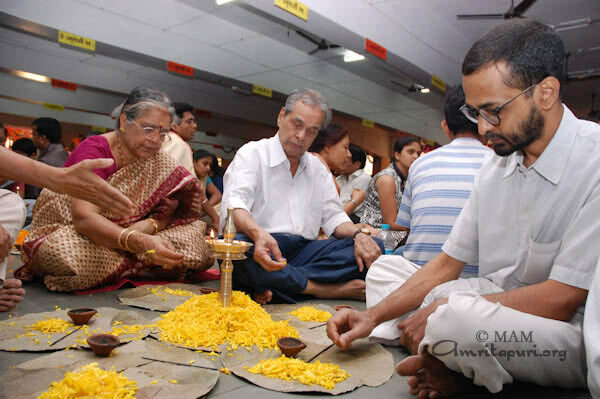 Sheila Dikshit, the Chief Guest during the function. 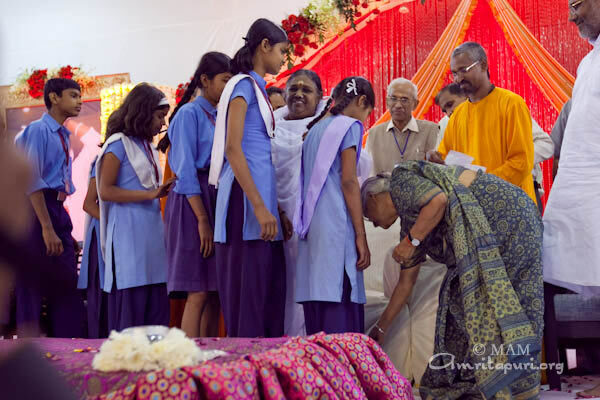 After a prayer that was sung by some of the Vidyalayam students, she assisted Amma to gave away 100 Vidyamritam Scholarships to poor students. 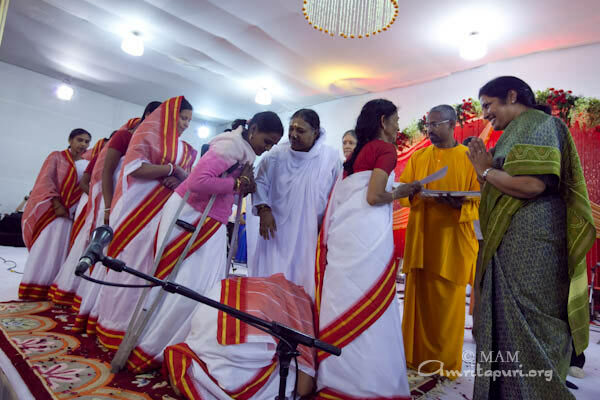 As the girls received Amma’s blessing, the Chief Minister made it an effort to humbly bend down to Amma’s feet with each of the envelopes that contained a scholarship. 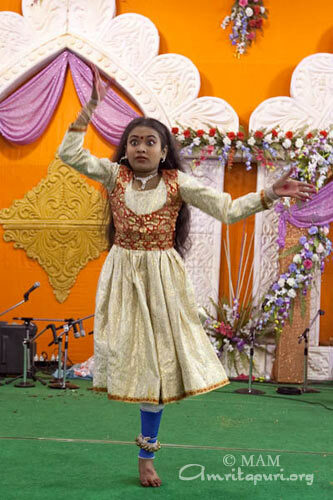 “These girls are really blessed with these grants and I wanted to do an extra prayer for each one, hoping that it would bring an even greater blessing to all of them,” said Sheila Dikshit. Union Minister of State for Human Resources Development, Smt. 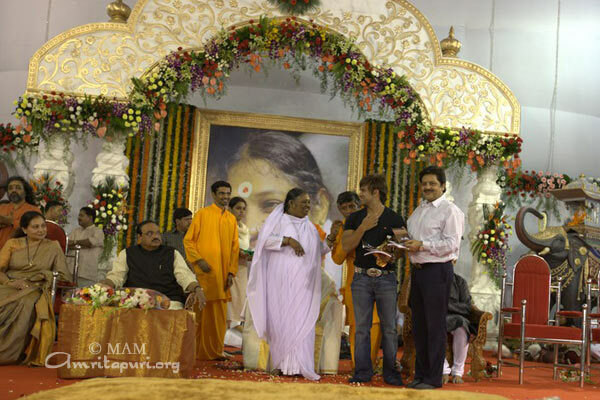 D. Purendeshwari, said there was no better way to celebrate this Women’s Day then to be in the presence of Amma. 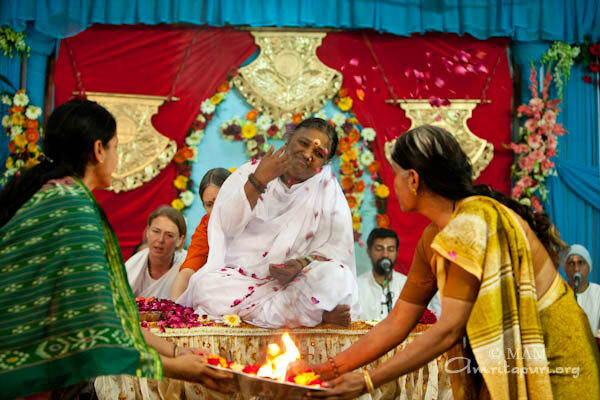 “If we look at her name: Mata Amritanandamayi, she who is filled with the nectar of eternal bliss, we can ask ,’How is she filled? It is because she is affectionate, she is giving and She is caring. So ultimately the happiness is in the giving. That is what we can all learn from. 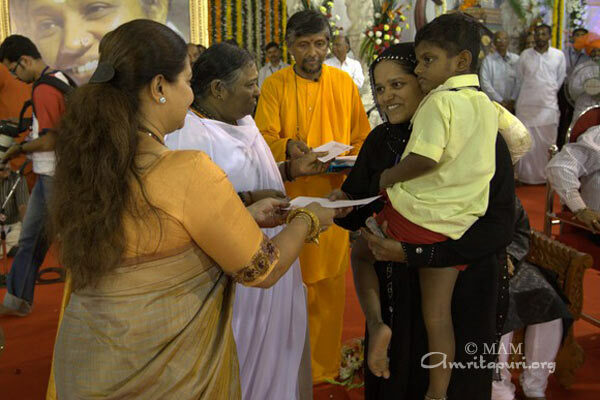 Amma is reaching out to the most marginalised sections, to people who are in need. 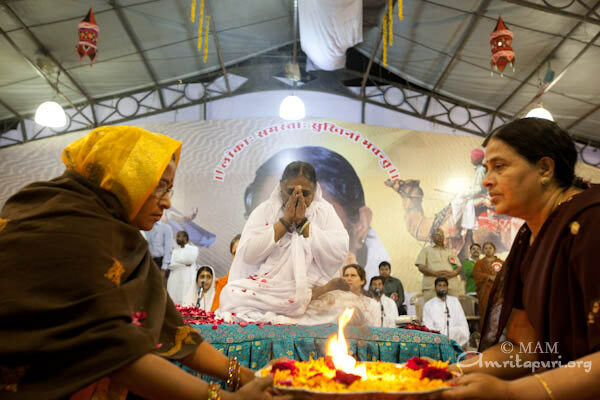 The good work that Amma is doing is blessing our country. 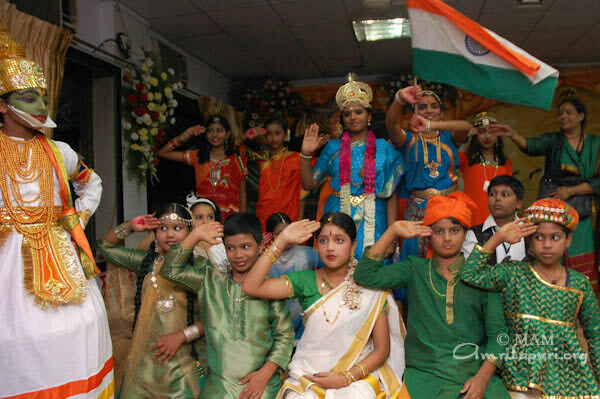 We here should all feel proud that we belong to a country we call Bharat, in whose soil sages and saints have taken birth, all who have spread one message: Love all. 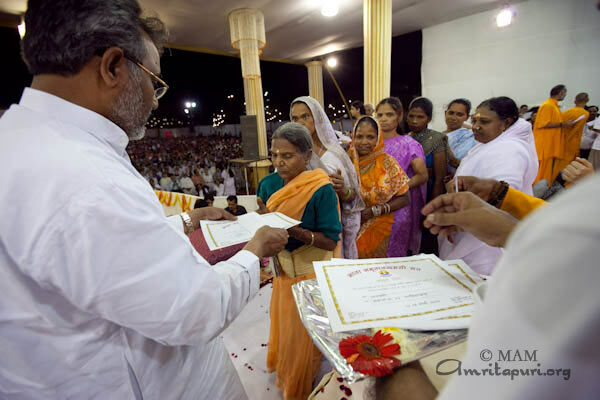 As long as we have people like Amma, we don’t need to worry much about our country.’ The minister then honored the women by giving away “Amritashree” to 5 women Self Help Groups. 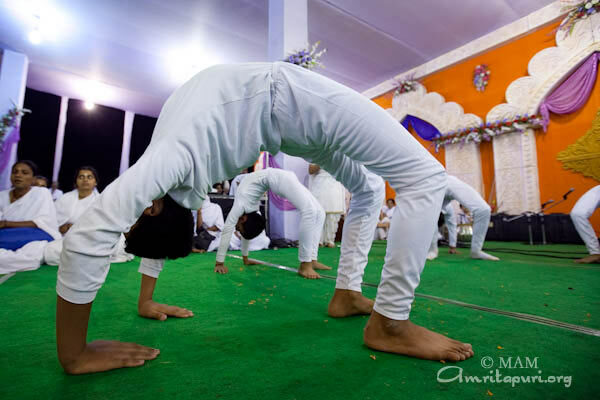 The other Guests during the functions were Sri Amrish Singh Gautam, MLA and Deputy Speaker of Delhi Assembly, Shri Dineshchandra, Mahamantri of International Council – Vishwa Hindu Parishad. 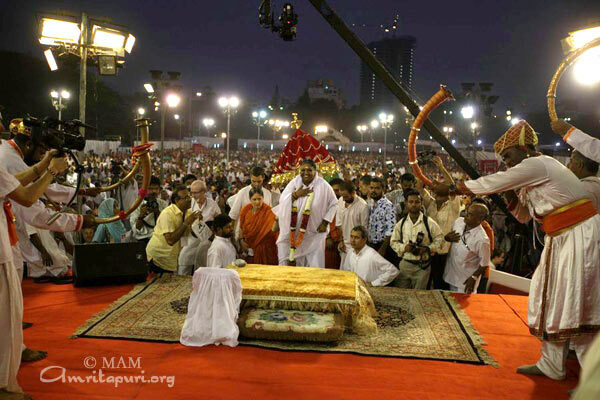 Amma personally blessed thousands of people from all walks of life, during the night-long programme. 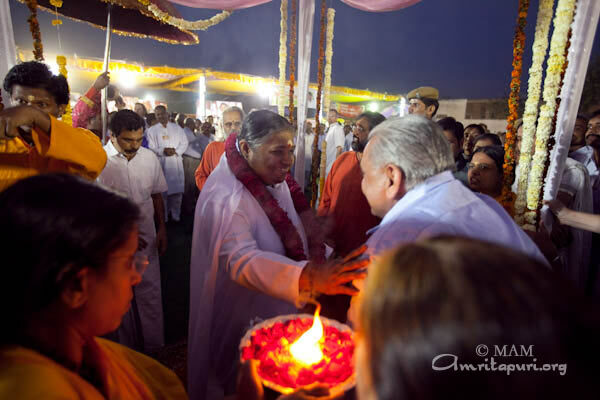 Amma was welcomed with a colorful celebration at her public program in Jaipur. 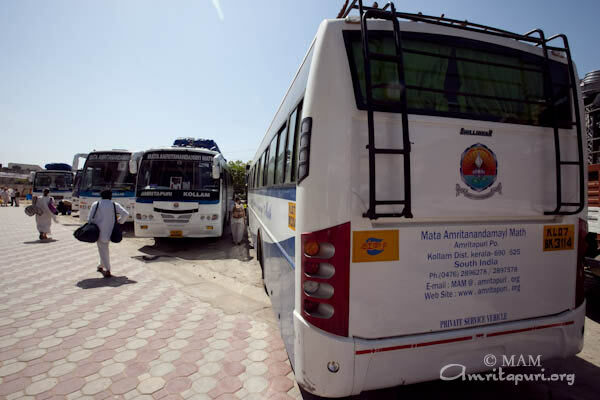 Buses full of devotees from nearby towns arrived in the pink city to participate in Amma’s satsang, bhajan, dhyan and darshan. 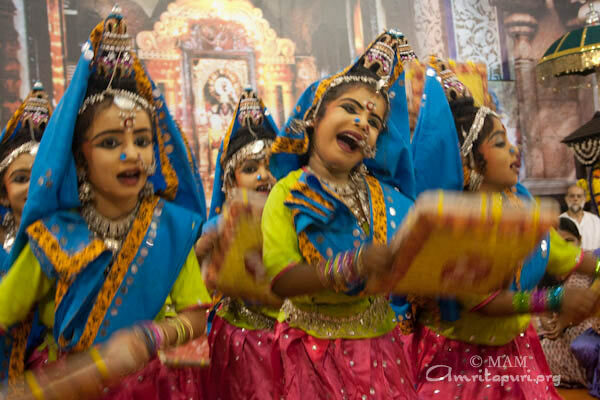 The backdrop of the stage showed a beautiful collage of Rajasthani impressions: Camels, women in folklore costumes, scenes of dance, traditional artwork and of course – Amma’s smiling picture. 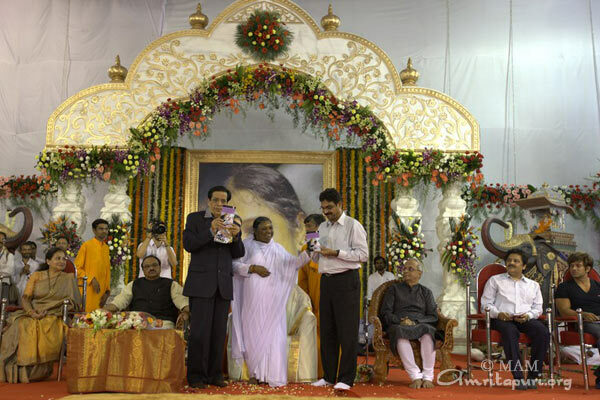 Several dignitaries shared the dias with Amma: Honorable Smt. 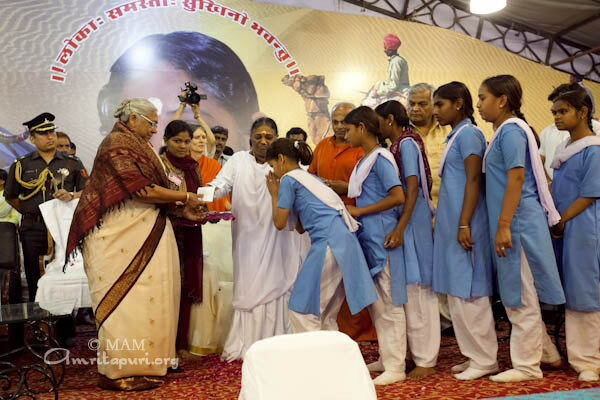 Prabha Rao, governor of Rajasthan, Sri Mahesh Joshi, member of parliament Jaipur, Sri. Brij Kishore Sharma, Transport Minister, Rajasthan, Sri. 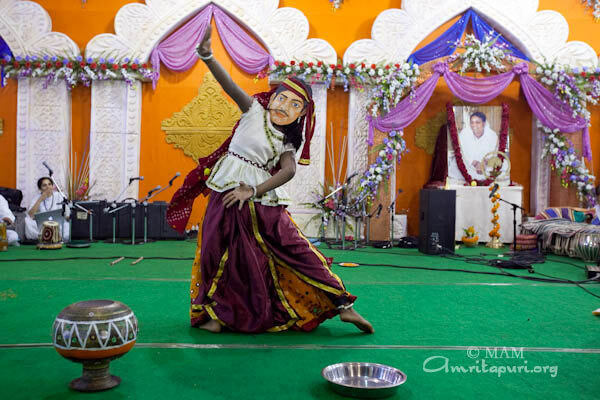 Jitendra Singh, Energy Minister, Rajasthan, Sri. 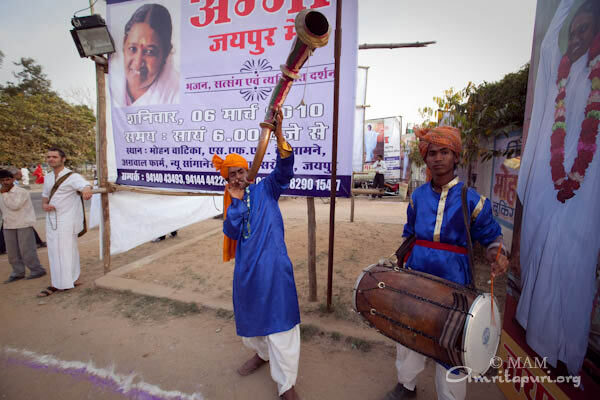 Ghanshyam Tiwari, Deputy Leader of the opposition party, Rajasthan Vidhana Sabha and Smt. 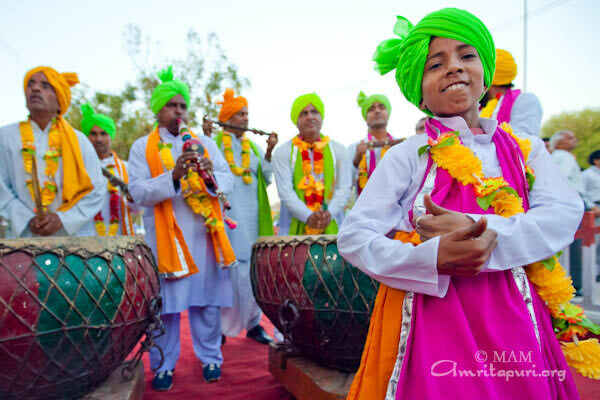 Jyoti Khandelwal, Mayor of Jaipur. 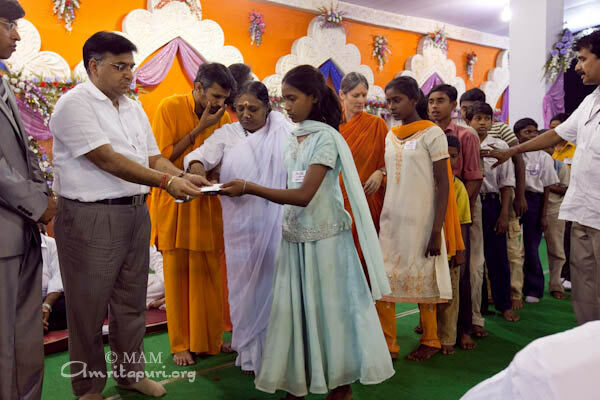 As part of MAM’s Vidyamritam project, 50 scholarships were given away to poor children. 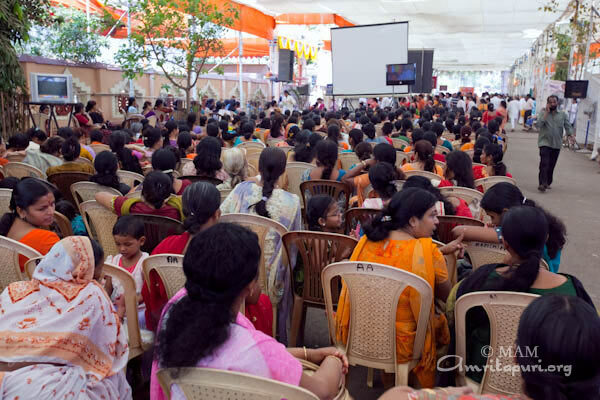 During the two days of the brahmastanam temple festival in Nerul, New Mumbai, large numbers of devotees flocked to the ashram to receive Amma’s darshan and participate in the satsang, bhajans, dhyan and special puja led by Amma. 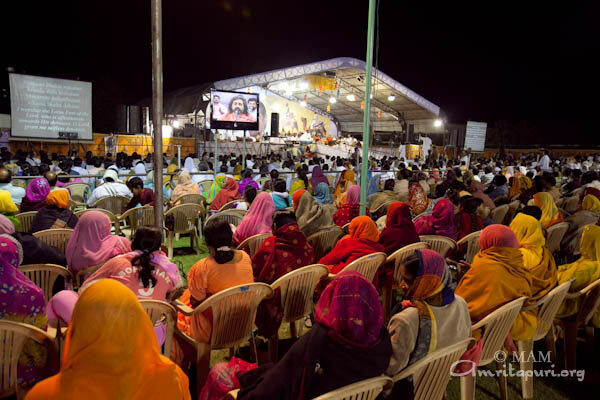 One important factor for the great success of the Nerul programme was the large number of AYUDH volunteers who helped out in nearly every area of the programme. 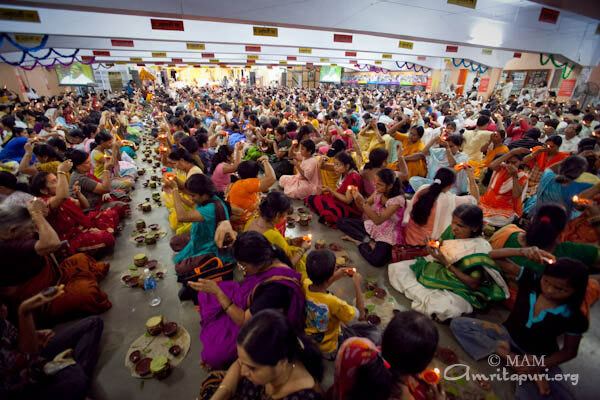 Over 100 youngsters worked day and night in the chappal stall, dish washing, recycling, puja setup and crowd control. 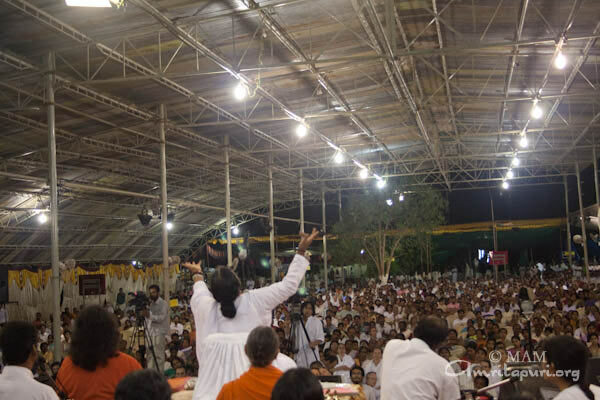 In order to make Amma’s programme more eco-friendly, the youth banned the use of all plastic bags in the chappal stall, saving at least 5,000 bags from being wasted. Instead, they provided reusable eco-friendly cloth bags. Also the trash management was run by the youngsters. 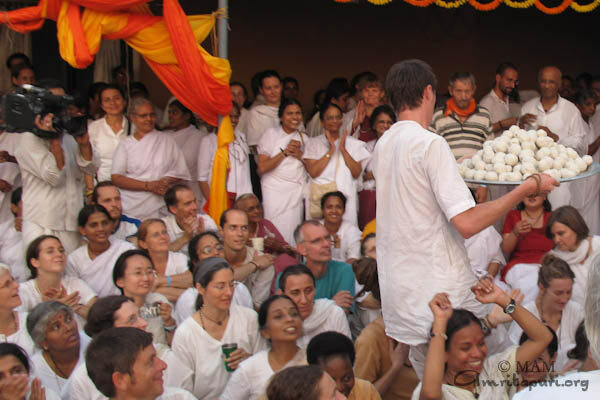 They separated the trash and used all food waste to create organic manure which soon will be utilized in the ashram’s garden. 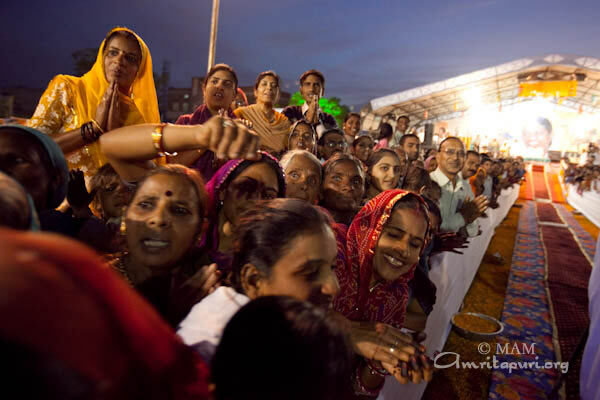 As it was the day of Holi, everyone was eagerly waiting for the moment when Amma would start the play. 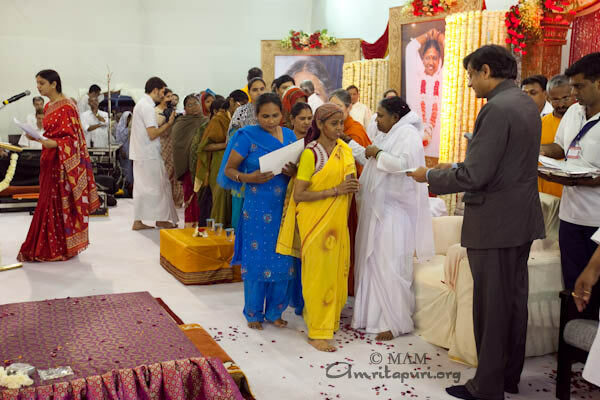 At the end of the last programme, the devotees brought a pichkari (water pistol) to Amma so that she could spray everyone with coloured water. 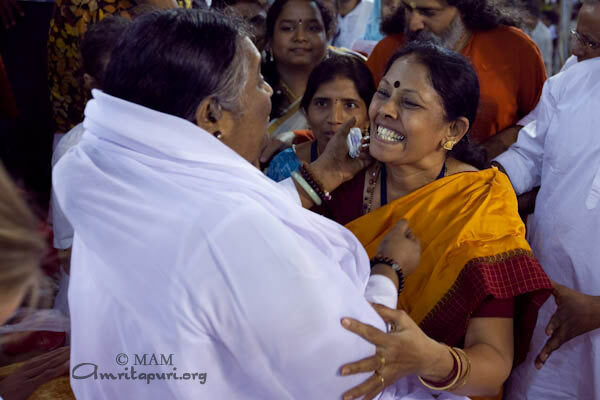 With a mischievous smile, Amma charged the water pistol again and again to create maximum impact all around her. 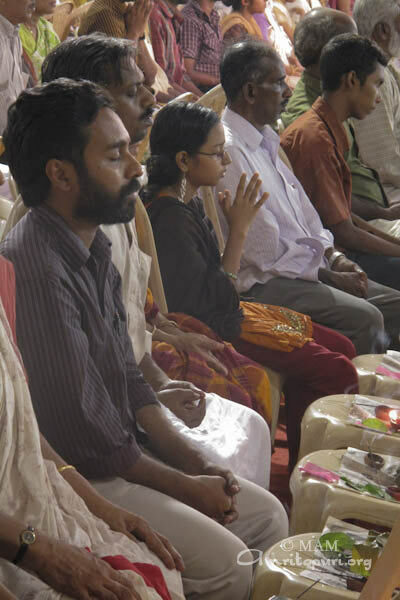 Even after Amma left the stage no one seemed tired. 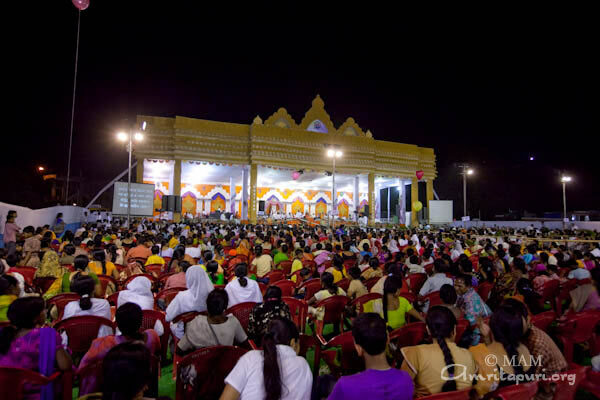 The devotees continued to throw coloured powder around until the whole ashram and all those staying there were covered in all shades of the rainbow. 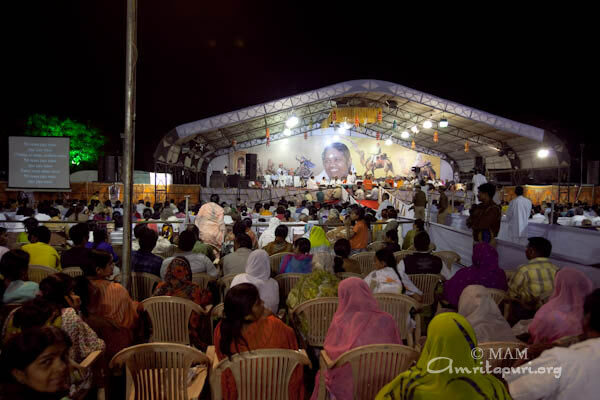 Amma started her programmes in Mumbai with a public function in the famous Shivaji Park, located right in the heart of the city. 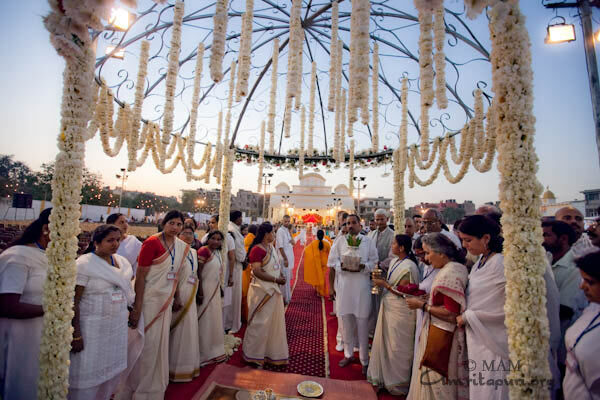 Amma was greeted at the dias with the traditional Maharastrian welcome — the sounding of horns followed by arati (the waving of lighted camphor) performed by five couples wearing traditional dresses. Chief guest Mr. Chagan Bhujbal, Dep. 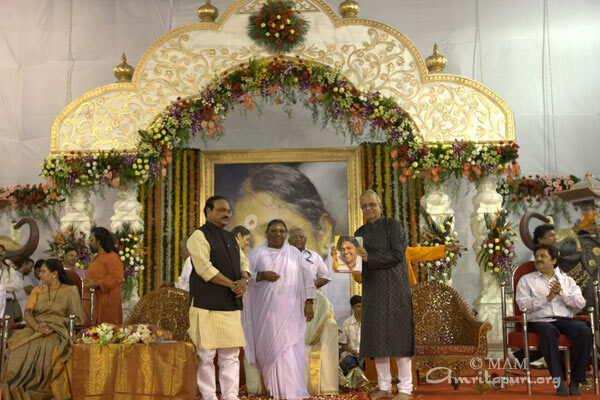 Chief Minister of Maharastra, welcomed Amma on behalf of the people of the state. 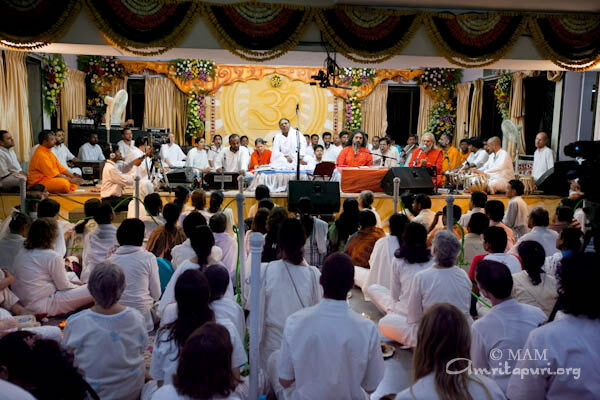 He said, “I know that after my speech I will go off the stage, but Amma will continue to sit here all night to meet the devotees one by one and give them darshan. 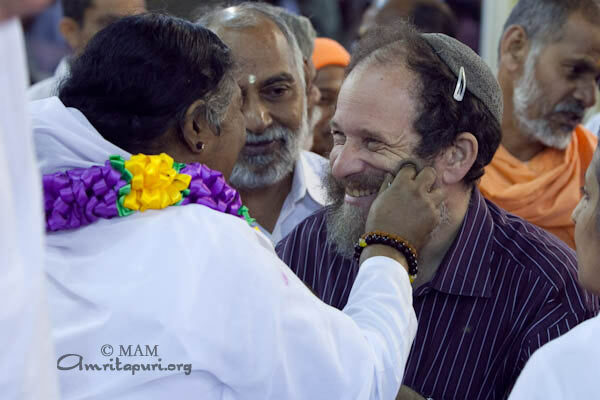 I have been observing this for many years and over time I have wondered why so many people from different religions and regions come to Amma. 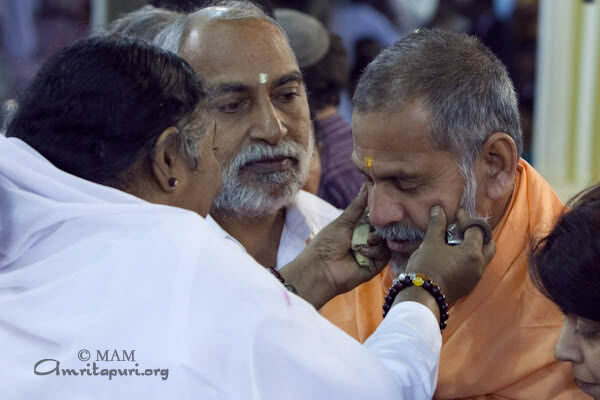 It’s not that she does any magic – It is Ammas healing touch, which feels like your own mother is holding you, kissing and blessing you that has drawn nearly 30 million people from 192 countries to her darshan over the years. Bollywood actress Smt. 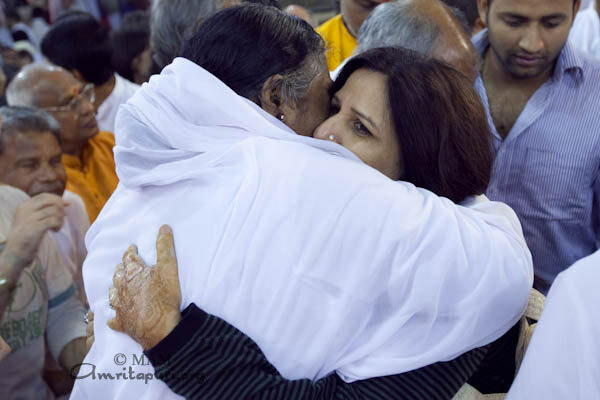 Smita Jayakar also addressed the gathering: “Apart from Ammas countless charitable activties, I admire that she is the “Hugging Mother”. 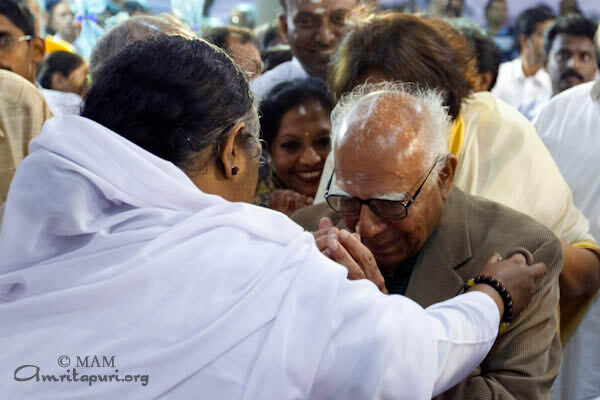 Her divine hug sends us to a state of unconditional love, awakening our anahata (heart) chakra. 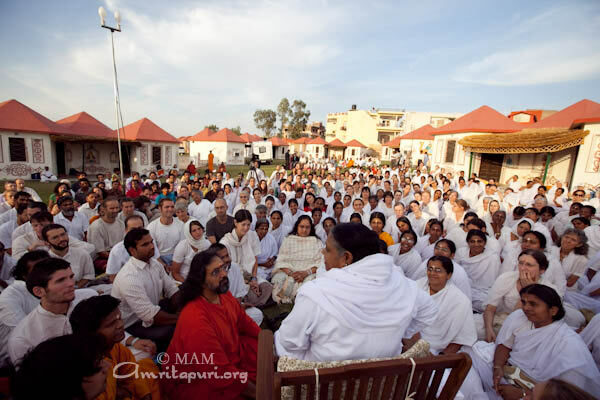 When this happens the “Me & You” disappears, only oneness and unity prevails. 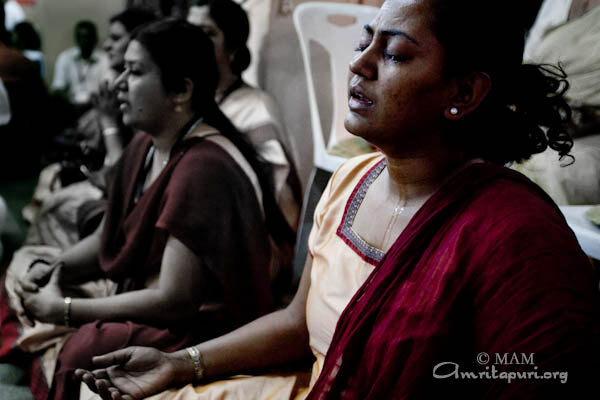 This improves the quality of our thoughts and deeds. 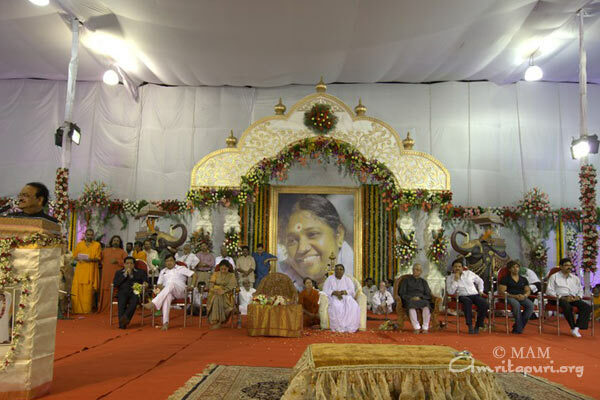 Other guests who shared the dias with Amma were: Mr Yash Birla, Industrialist, Birla Group of Industries, Justice Radhakrishanan, Kishore Avarsekar, Chairman, Unity Infra projects, Bala Nandagaonkar, MLA, Dr Jagannath Rao Hegde, Ex Sheriff of Mumbai, Udit Narayan, renowned playback singer. 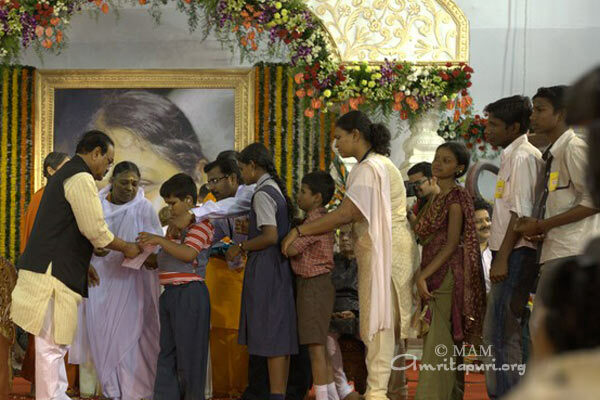 Amma gave away 100 more free scholarships to disadvantaged children as part of MAM’s Vidyamritam project. 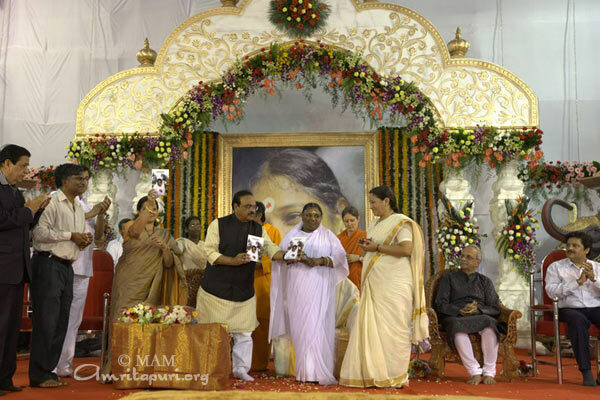 Five books in the local language of Marathi were released at the occasion: Amma’s biography (written in the Kadambari Style of Marathi), Amma’s inaugural address of the Vivekananda International Center in Delhi 2009, Amma’s address at the Conference of Women spiritual and religious Leaders in Jaipur 2007, Amma’s address at the occasion of receiving the Cinema Variete prize in Paris 2007 and a Souvenir Book of Amma’s visit to Mumbai 2010. 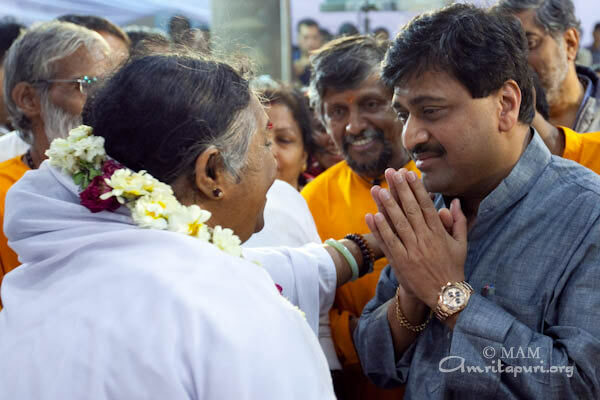 The Mumbai programme truly was a dignified start for the Holi festival, which began at midnight, while Amma was continuing her darshan, hugging people from all over the world and all sectors of society, from the fields of politics, arts, science, religion, music, film, media, business and IT. 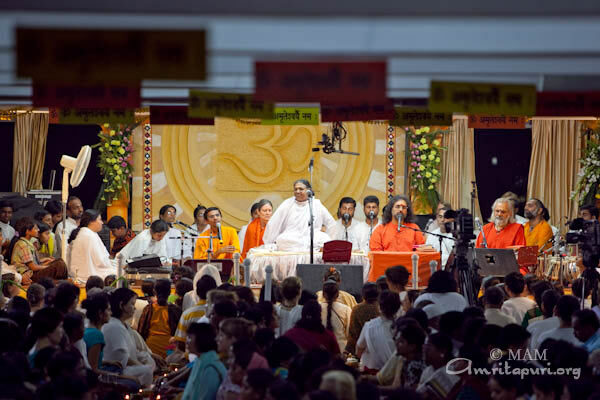 It is this convergence of people from all walks of life that made the programme so unique and colourful.